In vertebrates, the total number of vertebrae is precisely defined. Vertebrae derive from embryonic somites that are continuously produced posteriorly from the presomitic mesoderm (PSM) during body formation. We show that in the chicken embryo, activation of posterior Hox genes (paralogs 9–13) in the tail-bud correlates with the slowing down of axis elongation. Our data indicate that a subset of progressively more posterior Hox genes, which are collinearly activated in vertebral precursors, repress Wnt activity with increasing strength. This leads to a graded repression of the Brachyury/T transcription factor, reducing mesoderm ingression and slowing down the elongation process. Due to the continuation of somite formation, this mechanism leads to the progressive reduction of PSM size. This ultimately brings the retinoic acid (RA)-producing segmented region in close vicinity to the tail bud, potentially accounting for the termination of segmentation and axis elongation. In humans and other vertebrates, the number of bones (vertebrae) in the spine is determined early in development. The vertebrae form from blocks of tissue called somites that make segments along the body axis—a virtual line running from the head to the tail-end—of the embryo. The somites form as the embryo increases in length, with new somites forming periodically at the back near the embryo's tail-end. A family of genes called the Hox genes are involved in controlling the formation of the somites. However, it is not known whether they directly control the number of somites that form, or whether they control the length of the body of the embryo. Denans et al. studied the Hox genes in chicken embryos. The experiments suggest that the activation of some of the Hox genes in a structure called the tail-bud, which is found at the tail-end of the embryo, slow down the elongation of the body. The Hox genes achieve this by repressing the activity of a signaling pathway called Wnt so that Wnt activity in the tail-bud progressively decreases as the embryo develops. The elongation of the body stops when the levels of a molecule called retinoic acid increase in the tail-bud, which causes the loss of the stem cells that are needed to make the somites. Denans et al. 's findings suggest that Hox genes influence the timing of the halt in elongation, which in turn is important for determining the total number of somites that form. Understanding how Hox genes control the formation of the cells that will make up the somites and influence Wnt signaling is a major challenge for the future. Body skeletal muscles and vertebrae form from a transient embryonic tissue called paraxial mesoderm (PM). The PM becomes segmented into epithelial structures called somites, which are sequentially produced in a rhythmic fashion from the presomitic mesoderm (PSM). The PSM is formed caudally during gastrulation by ingression of the PM progenitors located initially in the anterior part of the primitive streak (PS) and later, in the tail-bud (Bénazéraf and Pourquié, 2013). At the end of somitogenesis, the embryonic axis is segmented into a fixed species-specific number of somites which varies tremendously between species ranging from as little as ∼32 in zebrafish to more than 300 in some snakes. The somites subsequently differentiate into their final vertebral and muscular derivatives to establish the various characteristic anatomical regions of the body. Hox genes code for a family of transcription factors involved in specification of regional identity along the body axis (Mallo et al., 2012; Noordermeer and Duboule, 2013). In mouse and chicken, the 39 Hox genes are organized in four clusters containing up to thirteen paralogous genes each. Hox genes exhibit both spatial and temporal collinearity, meaning that they are activated in a sequence reflecting their position along the chromosome and become expressed in domains whose anterior boundaries along the body axis also reflect their position in the clusters. Whether Hox genes control axis length and segment number has been controversial. Mouse mutants in which entire sets of Hox paralogs are inactivated show severe vertebral patterning defects but exhibit normal vertebral counts (Wellik and Capecchi, 2003; McIntyre et al., 2007). In contrast, precocious expression of Hox13 genes in transgenic mice leads to axis truncation with reduced vertebral numbers (Young et al., 2009). Furthermore, mouse null mutations for Hoxb13 or Hoxc13 result in the production of supernumerary vertebrae (Godwin and Capecchi, 1998; Economides et al., 2003). In chicken and fish embryos, the arrest of axis elongation has been linked to the inhibition of FGF and Wnt signaling in the tail-bud which leads to the down-regulation of the transcription factor T/Brachyury and of the Retinoic Acid (RA)-degrading enzyme Cyp26A1 (Young et al., 2009; Martin and Kimelman, 2010; Tenin et al., 2010; Olivera-Martinez et al., 2012). Downregulation of Cyp26A1 in the tail-bud ultimately leads to rising RA levels and to differentiation and death of the PM progenitors which terminates axis elongation. Premature exposure of the tail-bud to high RA levels in chicken or mouse embryos inhibits Wnt and FGF signaling and leads to axis truncation (Tenin et al., 2010; Olivera-Martinez et al., 2012; Iulianella et al., 1999) suggesting that the tail-bud must be protected from the differentiating action of RA. In the Cyp26A1 null mutant mice, RA-signaling reaches the tail-bud, prematurely inducing the downregulation of FGF signaling and the increase of Sox2 expression, resulting in axis truncation posterior to the thoracic level (Abu-Abed et al., 2001; Sakai et al., 2001). In chicken, the tail-bud starts to produce RA when explanted in culture after the 40-somite stage (Tenin et al., 2010). This late RA signaling activity in the tail-bud is involved in the termination of segmentation and axis elongation (Tenin et al., 2010; Olivera-Martinez et al., 2012). At the 40-somite stage, the mRNA for Raldh2, the RA-biosynthetic enzyme becomes expressed in the tail-bud potentially accounting for this late RA activity. What triggers this late expression of Raldh2 in the chicken tail-bud is however unknown. In vertebrates, the termination of axis elongation is accompanied by a progressive reduction in size of the PSM (Gomez et al., 2008; Gomez and Pourquié, 2009). The shrinking of the PSM which brings the segmented region producing RA in the vicinity of the tail-bud might also contribute to the raise in RA levels in the tail-bud and possibly to the late Raldh2 activation in the tail-bud. Thus in the chicken embryo, the timing of elongation arrest (and hence the total number of somites formed) could be in part controlled by the kinetics of PSM shrinking. PSM size depends on the velocity of somite formation which removes cells anteriorly and on the flux of cells from the primitive streak and tail-bud generated during elongation which injects cells posteriorly. How this flux of progenitors ingressing in the PSM is regulated over time, and which genes are regulating this process remain poorly understood. Hoxb1-9 genes have been proposed to control cell ingression of paraxial mesoderm precursors from the epiblast during gastrulation (Iimura and Pourquié, 2006). However, Hoxb1-9 genes are only expressed in anterior regions of the embryo precluding their playing a role in the control of axis termination. Here, we first investigate the relationship between the speed of somite formation and of axis elongation. We show that, in the chicken embryo, activation of Abdominal B-like posterior Hox genes in the tail-bud correlates with the slowing down of axis elongation, while the speed of somitogenesis remains approximately constant. Our data indicate that a subset of progressively more posterior Hox genes, which are collinearly activated in vertebral precursors, repress Wnt and FGF activity with increasing strength, leading to a graded repression of the Brachyury/T transcription factor. This progressively reduces mesoderm ingression and cell motility in the PSM, thus slowing down the elongation process. Due to the continuation of somite formation at a steady pace, this mechanism leads to the progressive reduction of PSM size. We measured the variations of velocities of axis elongation and somite formation in time-lapse videos of developing chicken embryos during the formation of the first 30 somites (Video 1). The velocity of somite formation shows limited variation during this developmental window (Tenin et al., 2010) (Figure 1A, n = 4 embryos for each condition). In contrast, axis elongation velocity increases during the formation of the first 10 somites and then it decreases until the 25-somite stage, when it drops abruptly (Figure 1A and Video 2, n = 41 embryos). The number of PSM cells decreases over time (Figure 1B, n = 5 embryos for each condition) while no significant difference in cell proliferation or apoptosis in the PSM and tail-bud is observed (Figure 1C–F, n = 4 embryos for each condition). Cell motility, which has been implicated in the control of axis elongation (Bénazéraf et al., 2010), also decreased between 15 and 27 somites (Figure 1G, n = 4 embryos for each condition). Thus, a parallel decrease in cell motility and in cell flux to the PSM accompanies axis elongation slow down. Time-lapse video of an embryo from Stage 5 HH to 29 somites showing the different phases of axis elongation (Bright-field, ventral view, anterior is up). Slowing down of axis elongation correlates with decreasing cell ingression in the PSM. (A) Velocity of axis elongation and of somite formation. (B) PSM cell number. (C–D) Tiling of confocal sections of 20-somite (C) and 25-somite (D) stage embryos. EdU positive cells are labeled in green, phosphorylated histone H3 (pH3) in red, and nuclei in blue (DAPI). (C′, D′) Higher magnification of PSM regions used to quantify the proliferation. (C″, D″) Confocal sections of parasagittal cryosections of tail-bud used to quantify cell proliferation. (E–F) Quantification of cell proliferation (E) and apoptosis (F) in 20–22 and 25–27 somites chicken embryos. (G) Cell motility in the posterior PSM. Time-lapse videos showing axis elongation slow-down around the 25-somite stage. Bright-field imaging of chicken embryos at 15–17 somites (left panel), 20–22 somites (middle panel), and 25–27 somites (right panel) (ventral view, anterior is up). Hoxb1-9 genes were shown to regulate cell flux to the PSM by controlling the timing of cell ingression from the epiblast (Iimura and Pourquié, 2006). Activation of Hox genes in the epiblast and tail-bud is collinear and occurs in two phases. First, the paralog groups 1 to 8 (and Hoxb9) are quickly activated within ten hours before the first somite formation (stage 7 HH [Hamburger and Hamilton, 1992]; Figure 2, n = 8 embryos for each condition). This phase is followed by a pause during formation of the first ten somites. Then between the 10 and 40-somite stage, the posterior Hox genes corresponding to the paralog groups 9–13 (and Hoxc8 and Hoxd8) become subsequently activated in a slower phase which takes almost 48 hr (Figure 2, n = 8 embryos for each condition). Hoxa13 is the first Hox13 activated at the 25-somite stage, when axis elongation slows down abruptly. Thus, there is a striking correlation between the timing of posterior Hox genes activation and the beginning of axis elongation slow down (Figures 1A and 2). Collinear activation of Hox genes in paraxial mesoderm precursors. 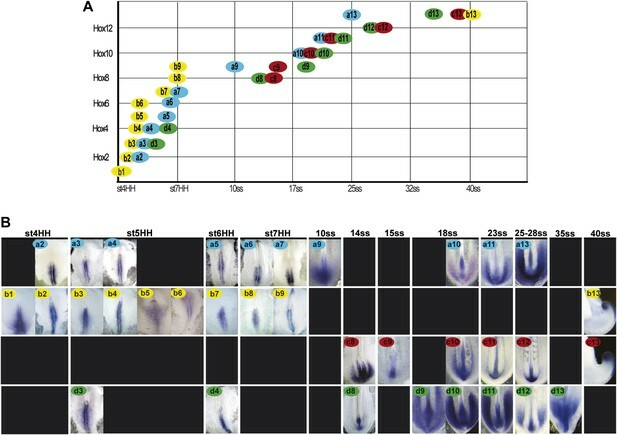 (A) Table showing the collinear onset of Hox genes expression in the epiblast/tail-bud generated from (B) Chicken embryos hybridized in whole-mount with Hoxa (blue), Hoxb (yellow), Hoxc (red), and Hoxd (green) probes. Each panel shows the beginning of activation of each Hox gene in paraxial mesoderm precursors in the epiblast of the anterior primitive streak or in the tail-bud. Hox probe used is indicated on the top of each panel. Anterior is up. Dorsal view. In order to test the role of posterior Hox genes on the control of cell ingression and cell motility in the developing chicken embryo, we used an in vivo electroporation technique, allowing to precisely target the paraxial mesoderm precursors in the epiblast of the anterior primitive streak (Bénazéraf et al., 2010) (Video 3). We developed a strategy allowing to overexpress two different sets of constructs in largely different populations of paraxial mesoderm cells by performing two consecutive electroporations of the paraxial mesoderm (PM) precursors of the epiblast of stage 4–5 HH embryos. Embryos are first electroporated on the left side of the primitive streak with a control Cherry construct, and then on the right side of the streak with a second vector expressing the yellow fluorescent protein Venus and a Hox construct (Figure 3A). This strategy results in essentially different PM cells expressing the two sets of constructs with the Cherry expressing cells enriched on the left side whereas Hox expressing cells are mostly found on the right side. When no Hox construct is present in the Venus vector, the Cherry and Venus-expressing populations of cells were observed to extend from the tail-bud to the same antero-posterior level of the paraxial mesoderm indicating that they began ingressing at the same time (Figure 3B, n = 8 embryos). In contrast, cells expressing Cherry were always extending more anteriorly than cells expressing Venus and one of the following posterior Hox gene: Hoxa9, Hoxc9, Hoxd10, Hoxd11, Hoxc11, Hoxa13, Hoxb13, or Hoxc13, indicating that these Hox genes can delay cell ingression of the PSM progenitors (Figure 3B–C n > 6 for each condition and not shown). This simply reflects the fact that cells ingressing later become located more posteriorly. Strikingly, the effect on ingression was progressively stronger when overexpressing more 5′ genes suggesting a collinear trend (Figure 3C). Inverting the order in which the constructs are electroporated did not affect the final phenotype. The distance between the anterior boundaries of the two domains was found to progressively increase with more posterior Hox genes as shown by measuring the ratio between Venus and Cherry posterior domains (Figure 3A–C). Over-expression of Hoxa10, Hoxc10, Hoxa11, Hoxc12, Hoxd12 and Hoxd13 showed no difference with the control Cherry vector (Figure 3A–C, n > 6 for each condition and data not shown). 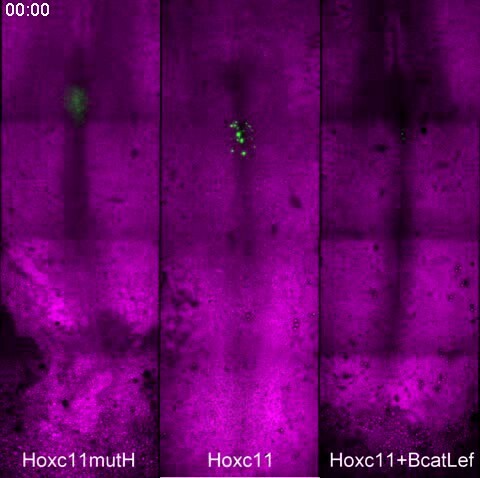 Using consecutive electroporation of Hoxd10 and Hoxc11 constructs labeled with Cherry and Venus, respectively, we observed that Hoxc11 has a stronger effect on ingression than Hoxd10 (Figure 3—figure supplement 1, n = 12 embryos). A similar result was observed when Hoxa13 was compared to Hoxc11 in the same assay (Figure 3—figure supplement 1, n = 6 embryos). Thus, a subset of posterior Hox genes is able to delay PSM cell ingression in a collinear manner. Time-lapse video showing the precise targeting of PSM progenitors and the ingression of the epiblast cells to form the PSM. Bright-field (purple) merged with fluorescent images of PSM cell progenitors electroporated with a control H2B-Venus (ventral view, anterior is up) from stage 6 HH onwards. Posterior Hox genes can regulate cell ingression in a collinear fashion. (A) Consecutive electroporation protocol. The ratio of the green domain (green bar, Hox expressing) over the red domain (red bar, control vector) measures the ingression delay. (B) Embryos consecutively electroporated first with Cherry and then with Venus together with control, Hoxa9, Hoxc11, or Hoxb13 vectors. Arrowheads: anterior boundary of Cherry (red) and Venus (green) domains. (C) Ratio of Venus over Cherry domains for posterior Hox genes. Dots: electroporated embryos. Bar indicates the mean. Stars: p-value of two-tailed Student's t-test applied between the different conditions. *p < 0.05; **p < 0.01; ***p < 0.005. Error bars: standard error to the mean (SEM). To analyze the effect of posterior Hox genes on ingression, PM precursors were electroporated with Venus and a Hoxa13 or a control construct and harvested after 5 hr when the electroporated cells start to ingress. No ectopic expression of laminin (Figure 4A,B–C″), acetylated tubulin (Figure 4A,D–E″), or E-cadherin (data not shown) was observed after Hoxa13 over-expression. We compared the number of Venus-positive cells in epiblast vs primitive streak and mesoderm in embryo sections. The majority of Hoxa13-expressing cells were still found in the epiblast while control cells have ingressed into the primitive streak and mesoderm indicating that Hoxa13 delays ingression by retaining cells in the epiblast (Figure 4F–H, n = 4 embryos for each condition). No up-regulation of the neural marker Sox2 was observed in the tail-bud of embryos electroporated with Hoxa13 (Figure 4I–J, n = 8 embryos for each condition) and very few cells were observed in the neural tube of embryos electroporated with Hox constructs (see Figure 3B, Figure 4I–J, Figure 6A–B, Figure 7D–J and Figure 9A and Videos 4–8). This indicates that the effect on ingression is not caused by the recruitment of PM precursor cells to a neural fate. Ingression of cells from the epiblast to the primitive streak occurs via an epithelium to mesenchyme transition which involves first destabilization and then complete loss of basal microtubules in these cells. This process has been shown to be regulated by a basally localized activity of the small GTPase RhoA (Nakaya et al., 2008). In order to test if the effect of the posterior Hox genes on delaying PSM progenitors ingression could involve regulation of microtubule stability, we used a dominant negative form of RhoA (DN-RhoA) as a tool to destabilize basal microtubules in the epiblast (Nakaya et al., 2008). We performed consecutive electroporations at stage 5 HH to overexpress a control Cherry vector in one population of PSM progenitors and Hoxa13 with DN-RhoA vectors in another population and allowed the embryos to develop for 20 hr. We observed that the two populations of cells reach the same anterior level (Figure 4K, n = 5/5 embryos) indicating that these cells ingressed at the same time. Altogether, these results suggest that Hox genes control PSM progenitors ingression through the regulation of basal microtubule stability in the epiblast. Epiblast cells overexpressing Hox genes do not convert to a neural fate. (A) Transverse section of a stage 7 HH chicken embryo labeled with phalloidin (white) to highlight the actin network and with laminin (red) to identify the epiblast basal membrane. Colored boxes indicate the different phases of differentiation of the mesoderm: epiblast (purple), ingressing cells (yellow), and mesoderm (blue). (B–E″) Transverse sections at the PSM progenitors level 5 hr after electroporation of a control Venus or of Hoxa13. (B-C”) Laminin immunolabeling (red) after Venus (B–B″) or Hoxa13 over-expression (C–C″). (D–E″) Acetylated α-tubulin immunolabeling (red) after Venus (D–D″) or Hoxa13 (E–E″) over-expression. (F–G) Transverse cryosections of the anterior primitive streak of an embryo electroporated with Venus (F) or with Venus and Hoxa13 (G). White arrow: cells ingressed in the primitive streak (F) and non-ingressed epiblast cells (G). Green: Venus; red: laminin; blue: nuclei. (H) Quantification of ingression in embryos electroporated with control or Hoxa13-expressing constructs. (I–J) In situ hybridization of 2-day old chicken embryos electroporated with Venus (I) or Hoxa13-Venus (J) expressing vectors. 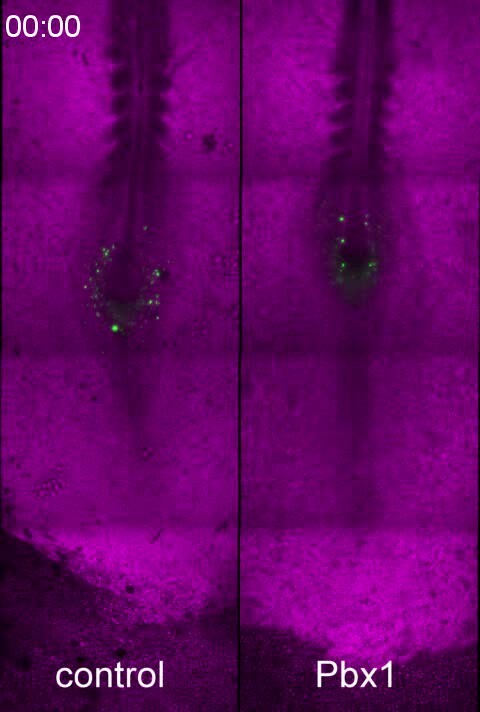 Left panel shows Sox2 expression in the neural tube and tail-bud, and right panels show GFP immunohistochemistry. (K) Chicken embryo consecutively electroporated with a control (Cherry, red) and a mix of Hoxa13+DN-RhoA (Venus, green). Arrowheads: anterior boundary of Cherry (red) and Venus (green) domains. Stars: p-value of two-tailed Student's t-test applied between the different conditions. ***p < 0.005. Error bars: standard error to the mean (SEM). 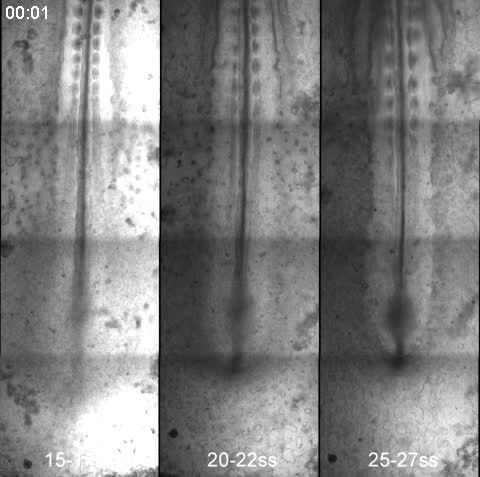 We next tested the effect of over-expressing posterior Hox genes on axis elongation (Figure 5A–C, Video 4, n = 47 embryos). Over-expression of either Hoxa9, Hoxc9, Hoxd10, Hoxd11, Hoxc11, Hoxa13, Hoxb13 or Hoxc13 but not of Hoxa10, Hoxc10, Hoxa11, Hoxc12, Hoxd12 and Hoxd13 in PM precursors caused a significant decrease of elongation velocity (Figure 5A–C and not shown). The effect of Hox genes becomes progressively stronger for more posterior genes (Figure 5C and not shown, Video 4). Therefore, the same posterior Hox genes can alter cell ingression and axis elongation with a similar collinear trend (Figures 3C and 5C). 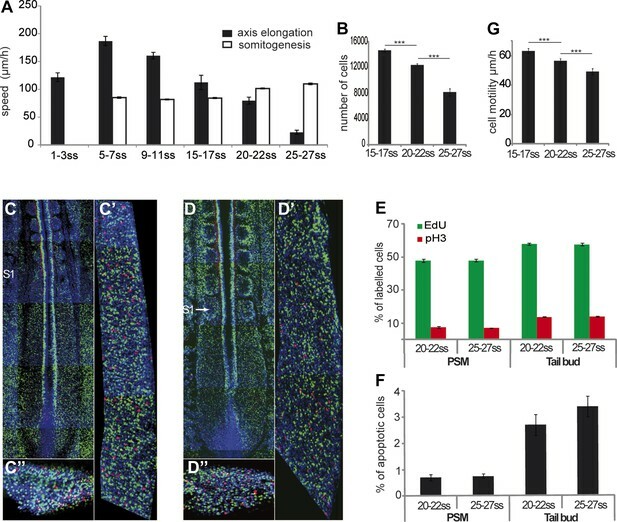 The cell-autonomous control of ingression by posterior Hox genes (Figure 4F–H) is expected to reduce the supply of motile cells in the posterior PSM. This should slow down elongation movements and could explain why such a non-cell autonomous effect on axis elongation is observed while only 30–50% PM cells express the Hox constructs. These data suggest that a subset of posterior Hox genes controls the slowing down of axis elongation by regulating ingression of PM precursors. Posterior Hox genes control the axis elongation velocity in a collinear fashion. (A–B) Time-lapse series of chicken embryos electroporated either with control (A) or Hoxa13 (B). Red line: position of Hensen's node. ss = somite-stage. (C) Velocity of axis elongation of embryos electroporated with either a control, Hoxa9, Hoxc9, Hoxd10, Hoxd11, Hoxc11, Hoxa13, Hoxb13, or Hoxc13 expressing constructs. Stars: p-value of two-tailed Student's t-test applied between the different conditions. *p < 0.05. Error bars: standard error to the mean (SEM). 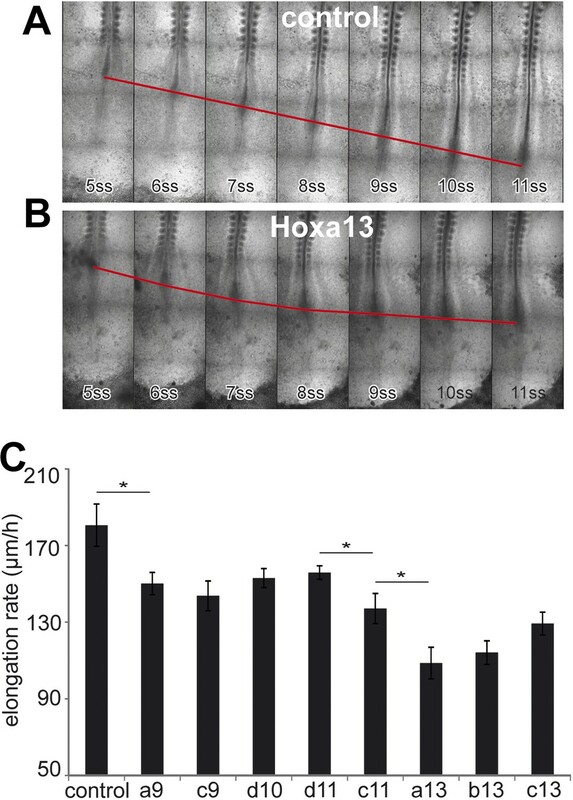 Effect of Hoxa9, Hoxc11, and Hoxa13 electroporation on axis elongation and ingression. Bright-field (purple) merged with fluorescent images of PSM cell progenitors electroporated with either a control H2B-Venus (first panel from the left), Hoxa9-ires2-H2B-Venus (second panel from the left), Hoxc11-ires2-H2B-Venus (third panel) or a Hoxa13-ires2-H2B-Venus (right panel) constructs (green) (ventral view, anterior is up) from Stage 6 HH onwards. Over-expression of Hoxa9, c11, and a13 affects ingression and axis elongation in a collinear fashion. In Drosophila and vertebrates, Hox genes expressed posteriorly can suppress the function of more anterior ones, a property termed phenotypic suppression or posterior prevalence (Duboule and Morata, 1994). We previously showed that posterior prevalence applies for the control of cell ingression by Hoxb1-9 genes (Iimura and Pourquié, 2006). To test whether this property also applies to the posterior Hox genes with an effect on axis elongation, we performed consecutive electroporations first with a mix of Hoxd10 and Hoxc11 constructs (leading to expression in the same cells, in green Figure 6A) and then with a mix of Hoxc11 and a control construct (a mutated Hoxc11 unable to bind DNA (Hoxc11mutH), in red Figure 6A). We observed that cells over-expressing the two functional Hox genes reach the same anterior position as cells over-expressing Hoxc11 and control (Figure 6A,C, n = 10 embryos). Thus Hoxc11 function is dominant over Hoxd10. Similarly, we observed dominance of Hoxa13 over Hoxc11 in the same assay (Figure 6B,C, n = 8 embryos). Therefore, posterior prevalence appears to generally apply for Hox control of cell ingression in the mesoderm (Iimura and Pourquié, 2006). As a result, the effect of Hox genes on cell retention in the epiblast should become progressively stronger as more posterior genes become activated. Posterior prevalence of posterior Hox genes. (A) Embryos consecutively electroporated first with Hoxc11-Cherry + Hoxc11mutH-Cherry and with Hoxd10-Venus + Hoxc11-Venus shown 24 hr after reincubation. (B) Embryos consecutively electroporated first with Hoxa13-Cherry + Hoxa13mutH-Cherry and then with Hoxa13-Venus + Hoxc11-Venus shown 24 hr after reincubation. Red arrowheads: anterior boundary of Cherry-expressing cells. Green arrowheads: anterior boundary of Venus-expressing cells. (C) Quantification of the ratio of Venus over Cherry expressing domains for the experiments shown in A and B. Each dot corresponds to one electroporated embryo and bar indicates the mean. (D–E) Luciferase assay measuring Wnt/βcatenin pathway activity after over-expression of the BATLuc construct together with a Renilla-expressing vector and either (D) control, Hoxa9, Hoxa13 or the combination of Hoxa9 and Hoxa13 expressing vectors. (E) Blow-up of the samples shown in (D). (F) BATLuc assay with serial dilutions of the Hoxa13 plasmid (in μg/μl on the x axis). (G) Western blot labeled with an anti-HA antibody showing embryos electroporated with Hoxa13 under the control of a doxycycline-responsive promoter activated with different doses of doxycycline (in μg/ml). (H) BATLuc assay after Hoxa13 over-expression under the control of a doxycycline-responsive promoter activated with different doses of doxycycline (in μg/ml on the x axis). Stars represent the p value of the two-tailed Student's t-test applied between the different conditions. **p < 0.01; ***p < 0.005. Error bars represent the standard error to the mean (SEM). Expression of anterior Hox genes in the primitive streak is maintained during the fast axis elongation phase occurring during the formation of the first ten somites, suggesting that there must be a mechanism blocking their effect on ingression during this time window (Figure 1A). TALE (Three Amino-acid Loop Extension) family members have been shown to differentially interact with anterior and posterior Hox genes (Chang et al., 1995; Moens and Selleri, 2006). In chicken, the only TALE gene expressed in PM precursors is Pbx1 which is detected in the primitive streak from stage 4 to 7 HH (Figure 7A, n = 8 embryos for each condition [Coy and Borycki, 2010]). Electroporation of a siRNA targeting Pbx1 in the epiblast resulted in strong down-regulation of Pbx1 (Figure 7B–C, n = 4 embryos for each condition). In consecutive electroporations performed first with Cherry and a control siRNA and then with Venus and a siRNA targeting Pbx1, cells electroporated with the Pbx1 siRNA were found extending more anteriorly than control cells (Figure 7D,K, n = 19 embryos). The effect of Pbx1 siRNA on ingression could be rescued by co-expressing Pbx1 (Figure 7E,K, n = 16 embryos). We compared in consecutive electroporations the effect of expressing first a control siRNA with either Hoxb7, Hoxb9, Hoxa9, Hoxc9, Hoxd10, Hoxd11, Hoxc11, Hoxa13, Hoxb13 or Hoxc13, and then the Pbx1 siRNA with the same Hox gene. Cells co-expressing Hoxb7 or Hoxb9 and the Pbx1 siRNA reached more anterior levels than cells co-expressing these Hox genes and the control siRNA (Figure 7F–G, K, n = 10 and 15 embryos respectively). In contrast, cells co-expressing either a control or the Pbx1 siRNA together with a posterior Hox gene were found to extend up to the same anterior level (Figure 7H–K and not shown, n > 8 embryos for each condition). Over-expression of Pbx1 in PM precursors after the 3-somite stage slowed down axis elongation (Figure 7L and Video 5, n = 12 embryos), suggesting that Pbx1 can restore the effect of anterior Hox genes on ingression during this time window. Thus, Hox-dependent control of ingression in the paraxial mesoderm requires Pbx1 for anterior but not for posterior Hox genes. Control of ingression of PM precursors by anterior Hox genes is dependent on Pbx1. (A) Pbx1 expression during somitogenesis. Red squares: region of PM progenitors. White dashed line: level of transverse section shown in bottom left. (B–C) Pbx1 expression in stage 6–7 HH chicken embryos electroporated with Venus and control siRNA (B) or Pbx1 siRNA (C). Left panels: Venus expression. (D–J) 2-day-old chicken embryos consecutively electroporated first with Cherry and a control siRNA and then with a Pbx1 siRNA and a Venus construct either alone (D) or together with Pbx1 (E), Hoxb7 (F), Hoxb9 (G), Hoxc9 (H), Hoxc11 (I), Hoxa13 (J). Arrowheads: anterior boundary of Cherry (red) and of Venus (green) domains. (K) Ratio of Venus over Cherry expressing domains. Dots: electroporated embryos. Bar indicates mean. (L) Effect of Pbx1 over-expression on axis elongation rate. Stars represent the p value of the two-tailed Student's t-test applied between the different conditions. ***p < 0.005. Error bars: standard error to the mean (SEM). Effect of Pbx1 over-expression between the 5- and 9-somite stage. Bright-field (purple) merged with fluorescent images of PSM cell progenitors electroporated with either a control pBIC (left panel) or a Pbx1pBIC (right panel) construct (green) (ventral view, anterior is up). Over-expression of Pbx1 slows down axis elongation. To identify effector targets regulated by posterior Hox genes, we electroporated epiblast PM progenitors in stage 5 HH embryos, either with a control H2B-Venus or with a Hoxa13-IRES-H2B-Venus vector, and we harvested embryos at 9 somites (Figure 8A). Venus-positive cells were sorted by Fluorescence Activated Cell Sorter (FACS) following tail dissociation and their transcriptome was analyzed using Affymetrix microarrays (Figure 8A, n = 2 × 2 arrays for each condition). The Wnt/βcatenin pathway targets, Axin2, Fgf8, and Sp8 were down-regulated in Hoxa13 over-expressing cells (Table 1, Supplementary file 1, Figure 8B) suggesting that posterior Hox genes might control axis elongation rate by progressively down-regulating the Wnt/βcatenin pathway. To test this hypothesis, we first performed in situ hybridizations (ISH) for Axin2, Fgf8, and T/Brachyury that show that their expression in the tail-bud is down-regulated when Hoxa13 becomes activated (Figure 8—figure supplement 1A–D, n = 8 embryos for each condition). Since the ISH technique is not quantitative enough to resolve slight differences, we performed quantitative Reverse Transcription PCR (qRT-PCR) on micro-dissected tail-buds from 10, 15, 20, and 25-somite stages for Axin2, Fgf8, and T/Brachyury. These experiments show a slight progressive down-regulation of these genes from the 10 to 20-somite stage followed by a significant decrease in gene expression at the 25-somite stage correlating with the slowing down of axis elongation as well as with the timing of posterior genes expression (Figure 8C–E, n = 5 embryos for each stage). 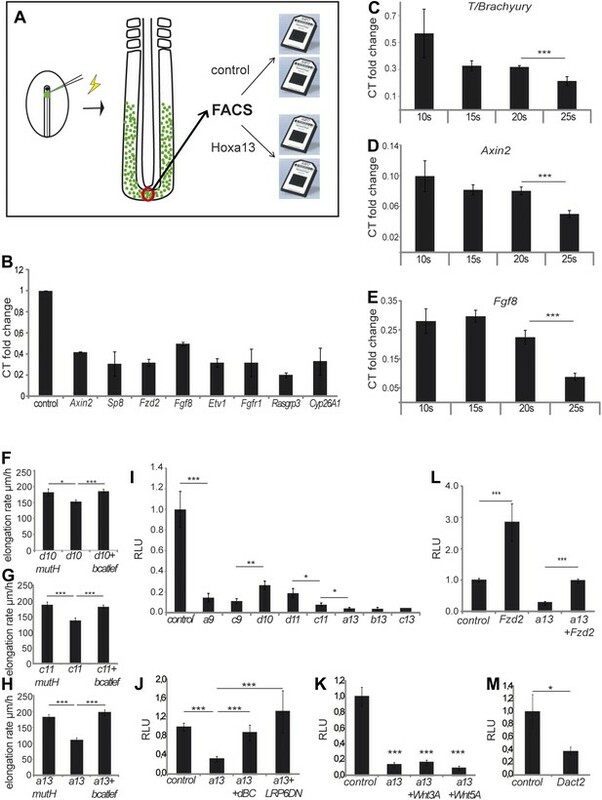 Co-electroporation of Hoxd10, Hoxc11, or Hoxa13 with βcatLEF (which activates the Wnt/βcatenin pathway [Galceran et al., 2001]) rescues axis elongation (Figure 8F–H, Videos 6–8, n = 41). We co-electroporated a Wnt/βcatenin firefly luciferase reporter (BATLuc) and a CMV-Renilla luciferase construct in PM progenitors together with either Venus or Hoxa9, Hoxc9, Hoxd10, Hoxd11, Hoxc11, Hoxa13, Hoxb13, or Hoxc13. These Hox genes induced a down-regulation of luciferase activity which increased in a collinear fashion (except for Hoxd10 and Hoxd11 which showed a weaker effect) (Figure 8I and Figure 8—figure supplement 2A, n = 83 embryos). All together, these results strongly suggest that the posterior Hox genes control axis elongation by modulating Wnt/βcatenin signaling activity. When co-expressing Hoxa9 and Hoxa13, the Wnt-repressive effect was equivalent to that of Hoxa13, indicating that posterior prevalence also applies to Wnt repression (Figure 6D–E, n = 30 embryos). By expressing various amounts of Hoxa13, we observed that Wnt repression is independent of the quantity of protein expressed (Figure 6G–H, n = 62 embryos), suggesting that Hox proteins levels are saturating in our experiments. Therefore, the same posterior Hox genes can regulate ingression, axis elongation, and Wnt signaling with strikingly similar collinear trends. Collinear repression of Wnt/βcatenin signaling by posterior Hox genes. (A) Design of the microarray experiment. (B) Validation by Q-RT PCR of selected Hoxa13 targets identified in the microarray experiment. (C-E) Q-RT PCR for (C) T/Brachyruy, (D) Axin2, and (E) Fgf8 at 10, 15, 20, and 25-somite stage from microdissected tail-buds. (F–H) elongation velocity of embryos over-expressing (F) Hoxd10mutH, Hoxd10 or Hoxd10+βcatLEF, (G) Hoxc11mutH, Hoxc11 or Hoxc11+βcatLEF, (H) Hoxa13mutH, Hoxa13 or Hoxa13+βcatLEF. (I) Luciferase assay measuring Wnt/βcatenin activity after over-expression of BATLuc together with CMV-Renilla and either control, Hoxa9, Hoxc9, Hoxd10, Hoxd11, Hoxc11, Hoxa13, Hoxb13, or Hoxc13. (J–M) Luciferase assay measuring Wnt/βcatenin activity after over-expression of BATLuc and CMV-Renilla and control, Hoxa13, Hoxa13+dBC, or Hoxa13+Lrp6ΔN (J), or control, Hoxa13, Hoxa13+Wnt3a or Hoxa13+Wnt5a (K), or control, Fzd2, Hoxa13, or Hoxa13+Fzd2 (L) or control and Dact2 (M). Firefly luciferase intensity values have been normalized to their respective Renilla values (RLU). Controls have been set to 1. Stars: p value of the two-tailed Student's t-test applied between the different conditions. *p < 0.05; **p < 0.01; ***p < 0.005. Error bars represent standard error to the mean (SEM). Activation of Wnt/βcatenin signaling and T over-expression rescue Hoxa13 axis elongation phenotype. Bright-field (purple) merged with fluorescent images of PSM cell progenitors electroporated with Hoxa13mutH-ires2-H2B-Venus (left panel), Hoxa13-ires2-H2B-Venus (second panel), T and Hoxa13-ires2-H2B-Venus construct (third panel) or βcatLEF and Hoxa13-ires2-H2B-Venus construct (right panel) (green) (ventral view, anterior is up) from Stage 6 HH onwards. Activation of the Wnt/βcatenin pathway rescues the axis elongation phenotype due to Hoxd10 over-expression. Bright-field (purple) merged with fluorescent images of PSM cell progenitors electroporated with Hoxd10mutH-ires2-H2B-Venus (left panel), Hoxd10-ires2-H2B-Venus (middle panel) or βcatLEF and Hoxd10-ires2-H2B-Venus construct (right panel) (green) (ventral view, anterior is up) from Stage 6 HH onwards. Activation of the Wnt/βcatenin pathway rescues the axis elongation phenotype due to Hoxc11 over-expression. Brightfield (purple) merged with fluorescent images of PSM cell progenitors electroporated with Hoxc11mutH-ires2-H2B-Venus (left panel), Hoxc11-ires2-H2B-Venus (middle panel), or βcatLEF and Hoxc11-ires2-H2B-Venus construct (right panel) (green) (ventral view, anterior is up) from Stage 6 HH onwards. We next analyzed how Hox genes interfere with Wnt function. Hoxa13 ingression phenotype is rescued by an activated form of Lrp6 or a stabilized form of Ctbbn1 (Figure 8J, n = 42 embryos) but not by Wnt3a or Wnt5a (Figure 8K, n = 30 embryos). This suggests that, genetically, Hox genes act on Wnt signaling at the membrane level. Over-expression of the Wnt receptor Fzd2 (down-regulated in Hoxa13 over-expressing cells (Figure 8B, Table 1 and Supplementary file 1)) with Hoxa13 rescued Wnt repression (Figure 8L, n = 29 embryos). Fzd2 is expressed in the tail-bud at 15 somites and down-regulated after 25 somites (Figure 8—figure supplement 1E, n = 8 embryos). Over-expression of the Wnt pathway component Dact2 (which is expressed in the tail-bud from 25 somites onward and up-regulated in Hoxa13 over-expressing cells [Figure 8—figure supplement 1F, n = 8 embryos, Table 1, Supplementary file 1]), repressed Wnt activity (Figure 8M, n = 9 embryos). In Hoxa13 over-expressing cells, the FGF receptor FGFR1, its ligand Fgf8, and its targets Etv1 and Cyp26A1 as well as the FGF pathway component Rasgrp3, were down-regulated while the FGF/MAPK inhibitor, Spred2, was up-regulated (Figure 8B, Table 1, Supplementary file 1), indicating that Hoxa13 can also inhibit FGF signaling. This inhibition is consistent with the down-regulation of PSM cell motility observed after Hoxc11 or Hoxa13 over-expression (Figure 8—figure supplement 2B, n = 20 embryos) (Bénazéraf et al., 2010). FGF down-regulation is expected since FGF and Wnt signaling reciprocally regulate each other in PM precursors (Aulehla et al., 2003; Naiche et al., 2011). Down-regulation of Cyp26A1, which degrades RA, can up-regulate RA signaling leading to repression of the Wnt pathway non cell-autonomously (Iulianella et al., 1999; Young et al., 2009; Martin and Kimelman, 2010). Together, these data suggest that posterior Hox genes act on a gene network converging toward autonomous and non-autonomous negative Wnt regulation. The T-box transcription factor T (aka Brachyury) is a well-characterized Wnt target which has been shown to control cell ingression to the mesoderm (Wilson et al., 1995; Yamaguchi et al., 1999). Q-PCR analysis of micro-dissected tail buds shows that T expression levels decrease between 10 and 20-somite stage and then significantly drop at the 25-somite stage (Figure 8C). Over-expressing T by electroporation often resulted in PM-expressing cells extending more anteriorly than control cells suggesting that they ingress earlier (Figure 9A–B, n = 6 embryos). Over-expression of T together with either Hoxa9, Hoxd10, Hoxc11 or Hoxa13 rescued the ingression delay (Figure 9A–B, n = 6, 11, 10 and 7 embryos respectively). T also rescued the elongation slow down observed after Hoxa13 over-expression (Video 6, Figure 9C, n = 4 embryos). A lower dose of T (0.5 μg/μl) only led to partial rescue of the Hoxa13 phenotype (Figure 9C, n = 4 embryos). Endogenous T expression is down-regulated in Hoxa13 over-expressing cells FACS-sorted from electroporated embryos (Figure 9D, n = 2 FACS sorted cell samples for each condition). Over-expression of a reporter generated by fusing one kilobase of the chicken T promoter to the firefly luciferase (cTprLuc) together with Hoxc11 or Hoxa13 and the CMV-Renilla luciferase show T repression which is stronger for Hoxa13 (Figure 9E, n = 19 embryos). Over-expression of βcatLEF leads to T up-regulation (Figure 9F, n = 20 embryos) and co-expression of Hoxa13 with βcatLEF totally rescues T repression (Figure 9F, n = 20 embryos) suggesting that Hox genes down-regulate T expression by repressing the Wnt/βcatenin pathway. Over-expressing T had no effect on BATluc activation (Figure 9—figure supplement 1, n = 8 embryos). This argues that the effect of Hox genes on epiblast ingression involves quantitative regulation of T expression levels. Hox genes effect on axis elongation involves Brachyury regulation downstream of the Wnt/βcatenin pathway. (A) Consecutive electroporation of PM precursors with Cherry and then with Venus together with T (left panel), Hoxa13 (middle), or a combination of the two vectors (right). Arrowheads: anterior boundary of Cherry (red) and Venus (green) domains. (B) Ratio of Venus over Cherry domains. Dots: electroporated embryos. Bar indicates the mean. (C) Axis elongation velocity of embryos electroporated with control, Hoxa13, or co-electroporated with Hoxa13 and either high or low dose of T. (D) Q-RT PCR quantification of T expression in control or Hoxa13-expressing PM progenitor cells. (E–F) Luciferase activity (RLU) after over-expression of cTprLuc and CMV-Renilla together with either (E) control, Hoxc11 or Hoxa13 or (F) control, βcatLEF, Hoxa13 or Hoxa13+βcatLEF. (G–I) Luciferase assay measuring Wnt/βcatenin activity after over-expression of BATLuc and CMV-Renilla and (G) Hoxa13mutH, Hoxa13dn, Hoxa13+Hoxa13mutH or Hoxa13+Hoxa13dn. (H) Hoxd10mutH, Hoxd10dn, Hoxd10+Hoxd10mutH or Hoxd10+Hoxd10dn, (I) Hoxc11mutH, Hoxc11dn, Hoxc11+Hoxc11mutH or Hoxc11+Hoxc11dn. (J) Luciferase assay measuring Wnt/βcatenin activity from 28-somite stage dissected tail-buds after over-expression of BATLuc and CMV-Renilla constructs and either Hoxa13mutH or Hoxa13dn, or Hoxa13mutH with Hoxc11mutH or Hoxa13dn with Hoxc11dn, or Hoxa13mutH with Hoxc11mutH and Hoxd10mutH or Hox13dn with Hoxc11dn and Hoxd10dn. (K, L) Q-RT PCR quantification of T, Axin2 (K), and Fzd2 (L) expression in PM progenitors co-expressing either Hoxa13mutH with Hoxc11mutH and Hoxd10mutH or Hoxa13dn with Hoxc11dn and Hoxd10dn. Stars: p-value of the two-tailed Student's t-test applied between the different conditions. *p < 0.05; **p < 0.01; ***p < 0.005. Error bars: standard error to the mean (SEM). A Hoxa13 truncated form is responsible for the dominant Hand-Foot-Genital syndrome in man (Mortlock and Innis, 1997). A similar truncation in the chicken homolog (Hoxa13dn) acts as a dominant-negative inhibiting the function of all Hox13 genes (de Santa Barbara and Roberts, 2002). When over-expressed before activation of Hox13 paralogs, Hoxa13dn had no effect on BATluc activity (Figure 9G, n = 18 embryos). However, co-expression with Hoxa13 in similar conditions abolished Wnt repression (Figure 9G, n = 18 embryos). Similar truncations in chicken Hoxd10 (Hoxd10dn) and Hoxc11 ( Hoxc11dn) also exert a dominant-negative effect on their wild-type counterparts (Figure 9H–I, n = 38 embryos). We over-expressed Hoxa13dn alone or combined with either Hoxc11dn or with Hoxc11dn and Hoxd10dn along with BATLuc and CMV-Renilla constructs in PM precursors of the streak at stage 8 HH. Embryos were harvested at the 28-somite stage when most Hox10-13 paralogs are expressed. Increasing the number of dominant-negative constructs results in a corresponding increase in luciferase activity (Figure 9J, n = 35 embryos). We next co-expressed the three dominant-negative vectors Hoxd10dn, Hoxc11dn, and Hoxa13dn together, along with Venus and FACS-sorted dissociated Venus-positive cells from tail-buds of 28-somite embryos. qRT-PCR analysis of T, Axin2, and Fzd2 in the Venus-positive cells shows up-regulation of the three genes (Figure 9K-L, n = 4 embryos for each condition). 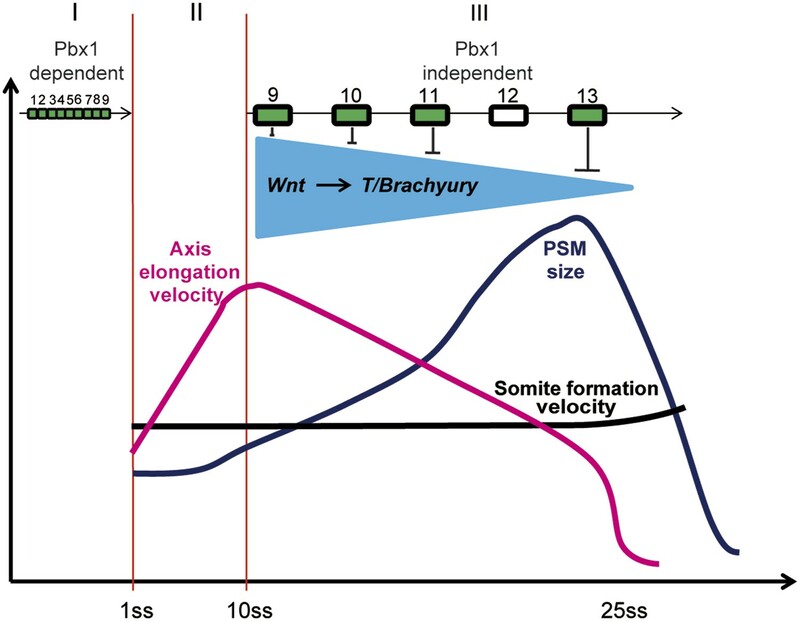 All together these results argue that a subset of posterior Hox genes gradually represses Wnt/βcatenin signaling and consequently T/Brachyury in paraxial mesoderm precursors of the epiblast. This progressive repression leads to reduced cell ingression and cell motility in the PSM, resulting in a slowing down of axis elongation. In order to identify the domain of posterior Hox proteins involved in repressing T/Brachyury expression, we generated chimera proteins where the different regions (N-terminal, homeodomain and C-terminal) of different posterior Hox proteins are swapped with the equivalent region of Hoxa5 which has no effect on axis elongation, Wnt activity and T/Brachyury expression (Figure 10A–B). Over-expression of cTprLuc along with a chimera where the homeodomain of Hoxa5 has been swapped with the one from Hoxa13 (Hoxa5Ha13) does not show any repression of luciferase activity while over-expression of a chimera where the homeodomain of Hoxa13 has been swapped with the one from Hoxa5 (Hoxa13Ha5) shows a strong repression of luciferase activity (Figure 10A–B, n = 35 embryos) suggesting that the homeodomain does not contain the major domain responsible for T/Brachyury repression. We next tested if either the N-terminal domain (N-ter) or the C-terminal domain (C-ter) is responsible for T/Brachyury repression. Overexpression of a chimera where the N-ter of Hoxa5 is swapped with the N-ter of Hoxa13 (NHoxa13HCa5) shows a strong repression of luciferase activity while a chimera where the C-ter of Hoxa5 is swapped with the C-ter of Hoxa13 (Hoxa5Ca13) does not show any repression (Figure 10C–D, n = 16 embryos) suggesting that the N-ter region of Hoxa13 contains the domain responsible for the repression of T/Brachyury. Sequence alignment of the N-terminal regions of Hoxa9, d10, c11, and a13 shows little conservation at the amino acid level suggesting that it is not a conserved amino acid domain but rather a structural domain that is responsible for the repression activity of these proteins (Figure 10—figure supplement 1). We next tested if the nature of the homeodomain could have a role in refining the level of repression of T by designing chimeras where the homeodomain of Hoxc11 and Hoxa13 was replaced by the homeodomain of Hoxa5 (Hoxc11Ha5 and Hoxa13Ha5, respectively) (Figure 10E). With the wild-type proteins, we observe a stronger downregulation of T/Brachyury with Hoxa13 than with Hoxc11 (Figure 9E). Surprisingly, when we overexpress Hoxc11Ha5 or Hoxa13Ha5 along with cTprLuc, we observe a stronger down-regulation of T/Brachyury with the chimera containing the Hoxc11 N-ter than with the one containing the Hoxa13 N-ter (Figure 10E–F, n = 26 embryos) suggesting that the homeodomain could be responsible for fine tuning T/Brachyury repression. Altogether our data suggest that the progressive deployment of posterior Hox genes in PM precursors during axis elongation leads to a collinear repression of the Wnt/βcatenin pathway and its target T/Brachyury. The N-terminal region of posterior Hox genes contains the repressive domain. (A, C, E) Design of the Hox chimeras. N-ter is in blue, the homeodomain in white, and the C-ter in red. (B, D, F) Luciferase assay measuring T/brachyury expression 20 hr after over-expression of cTprLuc and Renilla constructs together with (B) control, Hoxa5, Hoxa13, Hoxa5Ha13, or Hoxa13Ha5, (D) control, Hoxa13, NHox13HCa5, or Hoxa5Ca13, (E) control, Hoxc11Ha5, or Hoxa13Ha5. Stars represent the p-value of the two-tailed Student's t-test applied between the different conditions. ***p < 0.005. Error bars represent the standard error to the mean (SEM). Here, we show that a subset of posterior Hox genes represses Wnt/T signaling with increasing strength showing a collinear trend. We observe a similar collinear effect of these posterior genes overexpressed in PM precursors on delaying their ingression in the PSM and on the slowing down of axis elongation. This inhibition of Wnt signaling is accompanied by a down-regulation of FGF signaling which was shown to control elongation velocity by regulating cell motility in the PSM (Bénazéraf et al., 2010). 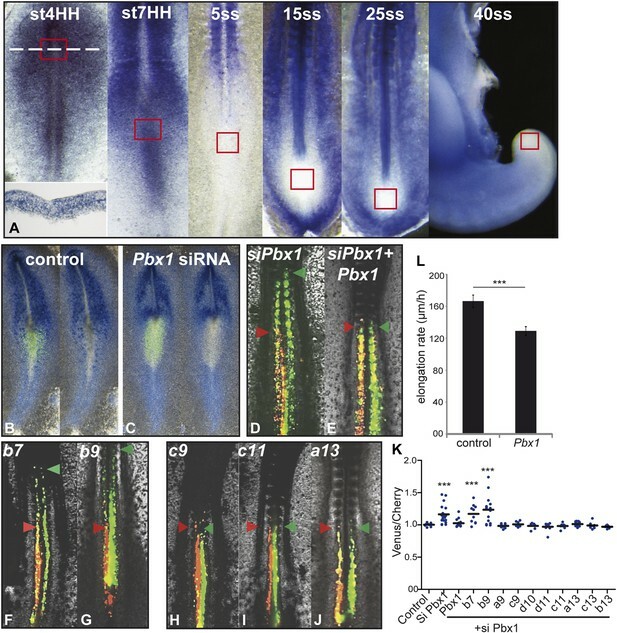 This suggests that posterior Hox genes are involved in the slowing down of axis elongation by acting both on the flux of cells in the posterior PSM and on the motility of PSM cells. 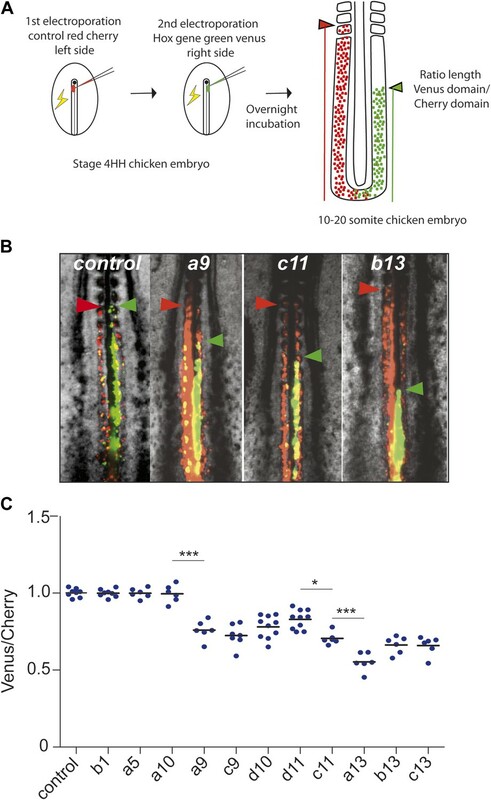 In the chicken embryo, PM precursors originate initially from the lateral epiblast which migrate toward the midline during formation of the primitive streak ( Selleck and Stern, 1991; Hatada and Stern, 1994). Around stage 4 HH, somite precursors begin to ingress from the superficial epiblast of the anterior primitive streak and posterior Node region (Psychoyos and Stern, 1996; Iimura et al., 2007). Two types of PM precursors have been identified in chicken and mouse embryos (Wilson et al., 2009). A first set derives from the Node/primitive streak border and exhibits long-term self-renewal properties (Selleck and Stern, 1991; Cambray and Wilson, 2002, 2007). These cells express Sox2 and Brachyury and they can contribute both to the PM (mostly to the medial part of the somites) and to the neural tube (Ordahl, 1993; McGrew et al., 2008; Tzouanacou et al., 2009; Kondoh and Takemoto, 2012; Olivera-Martinez et al., 2012). A second set derives from the anterior portion of the primitive streak and contributes to shorter clones restricted to the PM (Iimura et al., 2007; McGrew et al., 2008; Tzouanacou et al., 2009). After stage 4 HH, in the chicken embryo, the primitive streak begins to regress and after stage 13-14 HH, it becomes part of the tail-bud (Schoenwolf, 1979). At the 25-somite stage (stage 15 HH), the posterior neuropore closes and the tail-bud becomes enclosed into the tail fold. During these stages, PM precursors are continuously produced first by the primitive streak and then by the tail-bud. Fate mapping of the 25-somite stage tail-bud with quail-chick chimeras and diI labeling showed that the formation of the PM follows morphogenetic movements very similar to that seen earlier at the primitive streak level during gastrulation (Catala et al., 1995; Knezevic et al., 1998). After this stage, the remnant of the primitive streak becomes localized ventrally to form a structure known as the Ventral Ectodermal Ridge (VER) (Schoenwolf, 1979; Goldman et al., 2000). Whether cell ingression continues after posterior neuropore closure to generate the PM is not well established. Knezevic et al. reported that cell ingression from the VER stops at stage 16 HH (26–28 somites) (Knezevic et al., 1998) but Ohta et al. demonstrated that ingression into the mesoderm continues in the VER up to the 40-somite stage (stage 20 HH) (Ohta et al., 2007). There is also some lineage continuity at the level of the PM precursors of the Node/primitive streak border which were shown to become internalized to become part of the chordo-neural hinge in the tail-bud. DiI labeling of the late chordo-neural hinge in stage 20–22 HH (40–45 somites) embryos showed that mesoderm cells are produced by this structure at late stages (Olivera-Martinez et al., 2012). The cellular organization of the chordo-neural hinge has not been characterized and whether mesoderm production by this structure occurs through ingression movements involving an epithelium to mesenchyme transition as is seen for the production of paraxial mesoderm from the primitive streak is not established. Overall, very little is known about the movements of cells in the tail-bud after the 25-somite stage in chicken and mouse embryos. The respective contribution of the VER and the CNH to the PM at these late stages has not been characterized. If Knezevic et al. are correct, it could be that the action of posterior Hox genes on ingression ends at the 25-somite stage when Hoxa13 is first expressed. The strong effect of Hoxa13 on ingression might trigger the arrest of cell ingression leading to the slowing down of axis elongation observed at this stage. 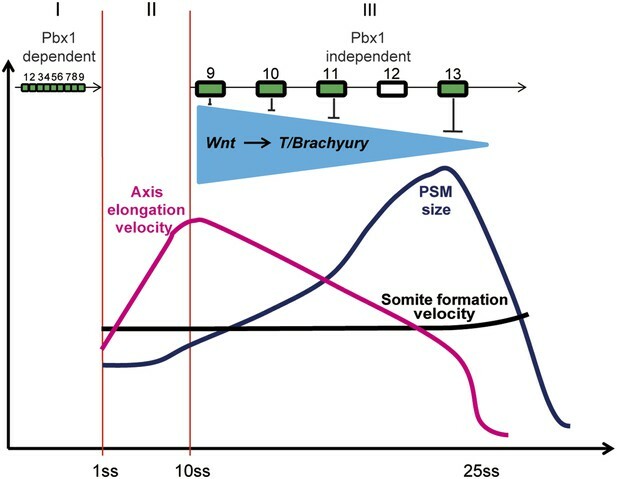 The resulting imbalance between the velocity of somitogenesis and of axis elongation could account for the progressive shortening of the PSM observed during the production of the next 25–28 somites. Alternatively, it could be that, as suggested by Ohta et al. and by Olivera-Martinez et al., ingression continues up to the 40–45 somite stage. In this case, Hoxa13 expression at the 25-somite stage would only significantly reduce the rate of cell ingression into the PM. At the 40–43 somite stage, Hoxb13 and Hoxc13 become expressed in the tail-bud potentially terminating further ingression. Whether Hox13 genes might regulate the late ingression of PM at the level of the VER, as shown by Ohta et al., or at the level of the CNH as proposed by Olivera-Martinez remains to be established. In both cases, however, the PSM is expected to shrink in response to Hox13 genes. Even though our experiments do not directly address the process whereby axis elongation stops, they suggest that Wnt and FGF repression in the tail-bud, which signals termination of axis formation (Olivera-Martinez et al., 2012), could be mediated by posterior Hox genes. By reducing the flux of cells to the PSM and their motility, posterior Hox genes can indirectly control its progressive shortening. Furthermore, the inhibition of FGF and Wnt signaling which are required for the segmentation clock oscillations provides an explanation for the arrest of somite formation before the complete exhaustion of the PSM described in avians (Bellairs, 1986; Tenin et al., 2010). 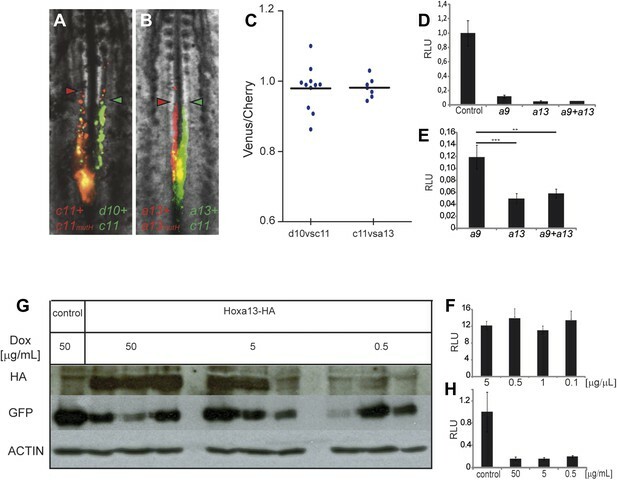 In vivo, the downregulation of the FGF target Cyp26A1 downstream of Hox13 genes (this report, Young et al., 2009) would leave the tail-bud more vulnerable to the increase of RA. Whether, the raise in RA levels caused by bringing the segmented region closer is also responsible for raldh2 activation in the late tail-bud remains to be explored. In such scenarios, posterior Hox genes indirectly control the termination of axis elongation and hence the segment number in the chicken embryo. In mouse embryos, over-expression of Hox13 genes results in axis truncation posterior to the thoracic level (Young et al., 2009). Remarkably, overexpression of Hoxa13, b13, and c13 from the same promoter in transgenic mice results in truncations at different antero-posterior levels (Young et al., 2009), arguing for different truncation efficiency of the mouse Hox13 proteins. This is highly reminiscent of our observations showing different quantitative effects of the overexpression of the same three Hox13 genes in chicken embryos. Duplications and deletions of regions of the mouse Hoxd cluster lead to heterochronic expression of posterior Hoxd genes in the tail-bud yet they do not seem to alter segment numbers (Spitz et al., 2001; Kmita et al., 2002; Tarchini and Duboule, 2006; Tschopp et al., 2009). This is also consistent with our observations that Hoxd genes have limited effect on axis elongation in our experiments. In transgenic mice overexpressing Hoxc13, Wnt targets and the FGF target Cyp26A1 were also found to be down-regulated (Young et al., 2009) as observed in chicken embryos overexpressing Hoxa13. This argues for a conserved role of posterior Hox proteins in the repression of the Wnt and FGF pathway between chicken and mouse embryos. In mouse embryos however, no strong raldh2 expression or late RA production is detected in the tail bud (Tenin et al., 2010) and axis elongation continues for a longer time resulting in tail formation. Moreover, raldh2 −/− mouse embryos which lack RA production during posterior body formation can form normal tails, suggesting that RA is not involved in axis termination in mouse (Cunningham et al., 2011). In mouse embryos, Wilson and Beddington (1996) initially reported an arrest of ingression when the posterior neuropore closes at the 30-somite stage (Wilson and Beddington, 1996), but Cambray and Wilson, 2002 subsequently provided evidence for continued ingression of cells in the PM after this stage (Cambray and Wilson, 2002). Thus, in mouse embryos, termination of axis elongation could simply result from exhaustion of PM progenitors caused by the slowing of axis elongation triggered by posterior Hox genes acting on cell ingression and motility. Remarkably, among amniotes, many species such as lizards, rodents, or monkeys bear a long tail whereas others such as birds or humans do not. Closely related species such as monkeys and apes can differ by the presence of a tail suggesting that the genetic switch involved in the control of tail formation is quite simple. Whether this switch involves an RA-dependent elongation arrest mechanism as seen in chicken and whether this control depends on posterior Hox genes is an attractive possibility which remains to be investigated. Our work provides evidence for functional collinearity in the control of axis elongation by posterior Hox genes. Our data also suggest that our overexpression conditions are saturating (Figure 6), abolishing any effect of gene dosage of the overexpressed Hox genes. This confirms previous results published in Iimura and Pourquié, 2006 showing that Hoxb1-9 gene expression driven by promoters of different strength (CMV, TK, and CAGGS) leads to similar ingression phenotypes. Together, this suggests that the information driving the quantitative effects of Hox proteins on Wnt repression, cell ingression, and elongation is built in the structure of the proteins themselves rather than reflecting the actual amounts of Hox proteins present. This functional collinearity might be related to the recently described structural collinearity of binding specificities reported for fly Hox proteins (Slattery et al., 2011). Our work suggests that low amounts of posterior Hox protein levels could be saturating in vivo. This is consistent with the analysis of paralog knock-out experiments showing that leaving only one single wild-type allele leads to a much milder phenotype than the deletion of an entire paralog group (Wellik and Capecchi, 2003; McIntyre et al., 2007). Also, increasing Hox doses by adding an extra mouse or human HoxD cluster does not alter the vertebral formula (Spitz et al., 2001; Kmita et al., 2002; Tarchini and Duboule, 2006; Tschopp et al., 2009). The fact that low levels of Hox proteins are saturating could confer great robustness to the system consistent with the extreme stability of intraspecific vertebral formula. That 8 of the 16 posterior Hox genes from all posterior paralog groups except Hox12 show an effect in the ingression, elongation, and Wnt signaling assays argue for an extreme redundancy of the system that could further explain the intraspecific robustness of the vertebral formula. We observe a trend showing an increasing strength of the effects on cell ingression, Wnt repression, and axis elongation when overexpressing progressively more 5′ Hox genes. This increasing trend can be partly accounted for by the posterior prevalence of posterior Hox genes observed in the control of ingression and in the repression of Wnt signaling for genes of different paralog groups. However, different quantitative effects were observed for genes from the same paralog groups arguing against a simple posterior prevalence model. This is in line with the result of inactivation of the entire paralogs groups such as Hox10 or Hox11 which demonstrates specific properties of each of these paralog groups arguing against a simple posterior prevalence model functioning in vertebral patterning (Wellik and Capecchi, 2003; McIntyre et al., 2007). We identify a role for the TALE protein Pbx1 in the control of cell ingression from the epiblast into the PSM by anterior but not posterior Hox genes. TALE homeoproteins have been shown to act as co-factors able to enhance DNA binding specificity of Hox genes (Moens and Selleri, 2006). Pbx proteins bind anterior Hox proteins via a specific hexapeptide sequence (Chang et al., 1995). The null mutation of Pbx1 in mouse leads to patterning defects of the axial skeleton but axis length appears essentially normal (Selleri et al., 2001). In contrast, double mutants for Pbx1 and Pbx2 often show a smaller number of somites suggesting that these two genes could act redundantly in patterning the axial skeleton (Capellini et al., 2008). In Pbx1−/−; Pbx2+/− mutants, anterior shifts of Hox expression boundaries in the paraxial mesoderm have been reported (Capellini et al., 2008). Such shifts are consistent with a precocious ingression of cells normally fated to a more posterior identity. Genetic studies on mouse T mutants have shown that graded T activity is required for body axis formation (Stott et al., 1993; Wilson and Beddington, 1997). Embryos with progressively lower quantities of T exhibit more severe axis truncations (Stott et al., 1993). Similar graded truncations are also observed for Wnt3a allelic series (Galceran et al., 1999), indicating that precise quantitative regulation of this pathway is required for completion of body axis elongation. Repression of the Wnt pathway and of T together with axis truncations was also observed in Hox13 over-expressing transgenic mice (Young et al., 2009). Our data suggest that the gradient of T activity is established by the graded regulation of Wnt signaling by posterior Hox genes, (Figure 11) thus providing a possible explanation for these complex phenotypes. At the cellular level, it argues that the Hox-dependent regulation of T levels in the epiblast is critical to control the balance between cell ingression and maintenance of a self-renewing paraxial mesoderm progenitor pool in the epiblast/tail-bud. Cell ingression requires an EMT that involves destabilization of the basal microtubules of epiblast cells followed by basal membrane breakdown (Nakaya et al., 2008). Inhibiting Rhoa activity can rescue the ingression delay caused by Hoxa13 overexpression, suggesting that posterior Hox genes can control cell flux to the PM by acting on basal microtubule stabilization in epiblast cells. As T is also able to rescue Hoxa13 phenotype on elongation, it could act upstream of this process and the details of such a molecular pathway remain to be investigated. Model representing the 3 phases (I, II, and III) of Hox action in PM precursors in the epiblast/tail-bud during axis elongation. Model representing the 3 phases (I, II, and III) of Hox action in PSM precursors in the epiblast/tail-bud during body axis elongation. Anterior Hox genes (paralogs 1–9) are expressed during phase I. They control cell ingression in a Pbx1-dependent manner leading to the collinear positioning of Hox genes expression domains in the anterior region of the embryo. No Hox genes are activated during phase II, allowing fast elongation of the embryonic axis. During phase III, posterior Hox genes (paralogs 9–13) are collinearly activated in PSM precursors. Our data suggest that collinear activation of posterior Hox genes leads to repression of Wnt signaling and its target T/Brachyury, which progressively increases in strength. This results in a progressive arrest of cell ingression in the PSM, leading to a decrease in axis elongation rate. Since the velocity of somite formation is roughly constant, PSM size starts to decrease when elongation velocity becomes slower than that of somite formation. During this latter phase the control of cell ingression by posterior Hox genes appears to be independent of Pbx1. 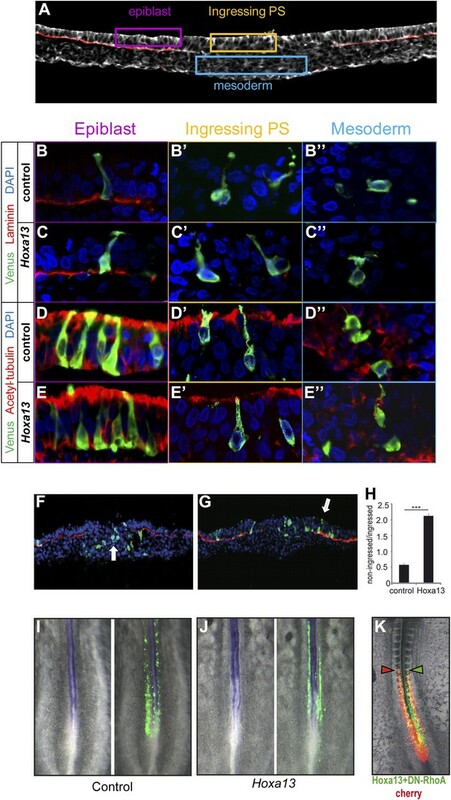 Wnt signaling was proposed to promote the paraxial mesoderm fate at the expense of the neural fate in a population of bipotential neuro-mesodermal stem cells in the tail bud (Martin and Kimelman, 2010, 2012; Gouti et al., 2014; Tsakiridis et al., 2014). Thus, the Wnt repression experienced by epiblast cells in response to posterior Hox genes overexpression could induce these cells toward a neural fate hence preventing them to ingress. However, Hoxa13 overexpression does not lead to up-regulation of the neural marker Sox2 in electroporated cells as detected by in situ hybridization and in our microarray analysis. Furthermore, electroporated cells are seen to enter the PM and do not enter the neural tube (Figure 4 and supplementary videos). This therefore suggests that posterior Hox genes are unlikely to control cell ingression by promoting acquisition of a neural fate in epiblast cells. 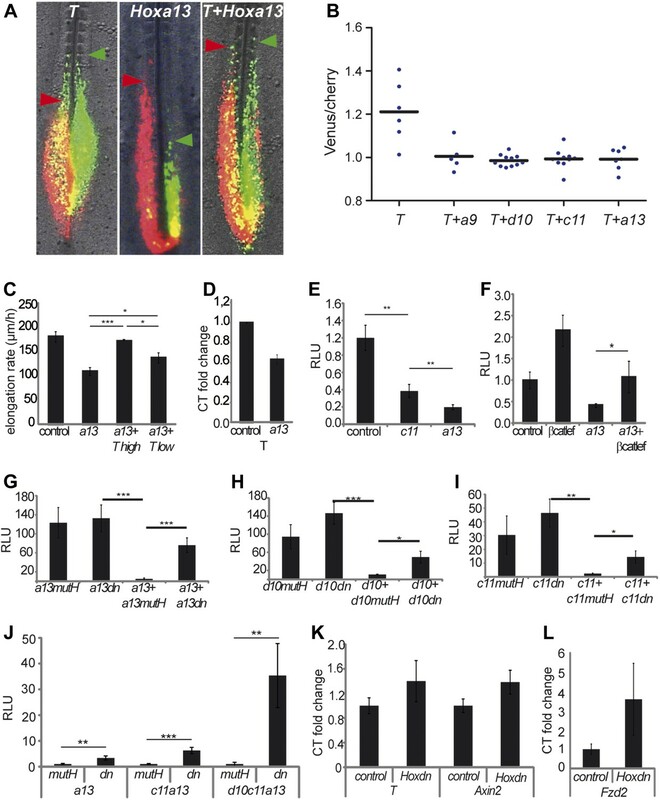 While we cannot completely rule out that a subpopulation of these cells remains in the tail-bud as Sox2-positive cells, it is unlikely that this contributes to the dramatic axis elongation slow down observed after posterior Hox genes overexpression. Thus our data suggest that disruption of the balance between epiblast and ingressing cells can be achieved by interfering with T levels either directly or indirectly by altering Wnt levels or Hox expression. The graded repressive activity of posterior Hox genes on the Wnt/T pathway might provide an evolutionary constraint that led to the selection of collinearity of posterior Hox genes (Duboule, 2007). Fertilized chicken eggs were obtained from commercial sources. Eggs were incubated at 38°C in a humidified incubator for approximately 24 hr. Embryos were prepared for Early Chick (EC) cultures (Chapman et al., 2001) and then electroporated. Embryos were staged following the Hamburger and Hamilton (HH) table (Hamburger, 1992) and by counting somites (somite stage: ss). Electroporation of the paraxial mesoderm (PM) precursors of the epiblast was carried out as described in Bénazéraf et al. (2010). For the axis elongation assay, the electroporation success is first monitored 3 hr after by examining the embryos under a fluorescent stereomicroscope. Only embryos successfully electroporated in the PSM progenitors (90–100%) are processed for videos (see the axis elongation measurement section). For the luciferase assay embryos are electroporated in the PM progenitors and examined 20 hr after electroporation (see the Luciferase assay section). In both assays, we finally obtain 90–100% of the electroporated embryos showing reporter expression restricted to the paraxial mesoderm. In rare cases (less than 10%), we observed few cells in the lateral plate mesoderm. These embryos were discarded. To better illustrate the accuracy of the electroporations performed, we now present a video showing the expression of a control construct electroporated in the anterior epiblast and showing the ingressing PSM cells (Video 3). To over-express two sets of constructs in different somitic precursors of the epiblast, two consecutive electroporations of the anterior primitive streak (PS) were carried out. Embryos were first prepared for EC culture at room temperature which pause their development. The first construct mixed with the control vector pCX-MyrCherry (gift from X Morin) was microinjected on one side of the PS groove and the first electroporation was carried out as described above right after injection. Only 10 s after the first electroporation, the second construct, containing the gene to over-express (Hox, T…) cloned in the pCAGGS-I2-MyrVenus, was then microinjected at the same level on the other side of the PS groove and immediately electroporated. This procedure targets the entire paraxial mesoderm territory of the epiblast of the anterior primitive streak on the electroporated side. Thus, in these experiments, we only track the timing of ingression of the most anterior epiblast cells which give rise to the most anteriorly localized progeny in the paraxial mesoderm. By biasing the position of the electrode on the right or on the left side of the primitive streak, we can ensure that the electroporation is biased on one side allowing easier observation of the anterior boundaries of the over-expressing cells. In most cases, however, some electroporated cells are seen on both sides despite this bias. The control Cherry vector is usually found to be more bilateral than the Hox expressing Venus-positive cells as can be seen from the pictures, which reflects an effect specific to Hox genes. Inverting the order of the electroporated plasmids in consecutive electroporation has no effect on the outcome of the experiment, and similar results are observed when the entire somitic territory of the epiblast of the anterior streak is electroporated. Following consecutive electroporation, embryos were cultured in a humidified incubator at 38°C to resume their development. 3 hr after electroporation, the embryos were screened based on fluorescence to ensure that both constructs were expressed and that the correct region was targeted for each construct. At this stage, up to 70% of the embryos are successfully electroporated. The embryos were then reincubated at 38°C until they reach the 15-somite stage (∼20 hr). As can be seen on the embryos shown in Figure 3, Figure 6, and Figure 9 or in the videos, virtually no cells are seen outside of the paraxial mesoderm meaning that the electroporation accurately targeted the anterior streak epiblast. Since expression of the constructs is driven by the ubiquitous CAGGS promoter, even a slight inaccuracy in positioning the electrode would result in expression in the neural tube or the lateral plate. A fluorescent stereomicroscope (Leica M205 FA) equipped with a color camera was used to track anterior boundaries of both control Cherry-expressing cells and mutant Venus-expressing cells. At this stage, up to 60% of the electroporated embryos are exclusively electroporated in the PSM and retained for further analyses (∼10% are discarded because of developmental defects due to the consecutive electroporation procedure). We used the ‘Measure’ plugin of ImageJ to measure the distance between the tail-bud and anterior boundary of both Venus and Cherry-expressing domains in the same embryos. We used these measures to calculate the ratio of Venus over Cherry domains. The Dot-Plot resulting from these ratios was generated using Graphpad 5 (Prism). Paraxial Mesoderm (PM) progenitors in the anterior primitive streak were electroporated in Stage 5 HH embryos with either a control vector pCAGGS-Venus or pCAGGS-Hoxa13-IRES2-Venus and cultured in a humidified chamber at 38°C for 5 hr. Embryos were then fixed in 4% paraformaldehyde at room temperature for 40 min and immunolabeled for GFP, laminin, and DAPI as described below. Embryos were then mounted and imaged with a Zeiss 510 NLO equipped with a 20× NA 0.8 objective. 80 µm z-stack were acquired (one section every 0.42 µm), and cells were scored with respect to their position in the primitive streak or in the epiblast after 3D reconstruction and optical transverse sections using Imaris software. Epiblast cells were counted as ‘non-ingressed’ and primitive streak/mesodermal cells as ‘ingressed’. Whole mount RNA in situ hybridizations were carried out as described (Henrique et al., 1995). Pictures of whole embryos were made using a macroscope (Z16APOA, Leica) with a 1× planapo objective (Leica) and a high resolution color camera (DFC 420C, Leica). Chicken Pbx1 RNA probe is described in Coy and Borycki (2010). The Fgf8 intronic probe is decribed in Dubrulle and Pourquié, (2004). A 750-bp fragment of the coding sequence (from nucleotide 301 to 1061) of chicken Fzd2, the last 800 bp of the coding sequence of chicken Dact2, intron 6 of chicken T, a 948-bp fragment of cSox2 coding sequence (gift from B Pain) were used as probes. Chicken Hox RNA probes were Hoxa2 (Prince and Lumsden, 1994), Hoxa3, b3, d4 (gift from R Krumlauf), Hoxa10, a11, a13, c4, c5, c6, c8, c9, d8, d9, d10, d11, d12, and d13 (gift from C Tabin), Hoxb1, b4, b7, b9 (described in Iimura and Pourquié, 2006), Hoxb8 (gift from A Kuroiwa), Hoxb5, c10, c11, c12, c13, and b13 (cloned by PCR using ENSEMBL sequence informations), Hoxa4 (chEST 427p4, Geneservice), Hoxa5 (chEST 382m24, Geneservice), Hoxa6 (chEST 338h20, Geneservice), Hoxa7 (chEST 259o11, Geneservice), Hoxa9 (chEST 333f16, Geneservice), Hoxb2 (chEST 194e4, Geneservice), Hoxb6 (ChEST147L22, Geneservice), Hoxd3 (chEST 195d1, Geneservice). 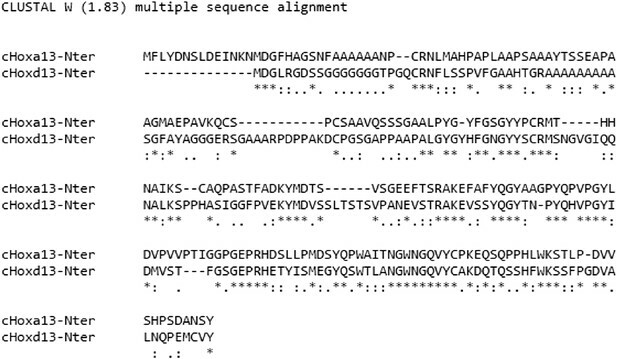 Full-length coding sequences for chicken Hox genes, Pbx1, T, Wnt3a, Wnt5a, Dact2, and mouse Fzd2 were PCR-amplified from chicken or mouse cDNAs using the proofreading Accuprime pfx DNA polymerase (Invitrogen, Grand Island, NY). PCR fragments were then cloned in either, Grand Island, NY P221 (Invitrogen) or pENTR-D/TOPO (Invitrogen) to generate gateway (Invitrogen) entry clones. The constitutively active version of lef1 (βcatLEF) (gift from R Grosschedl) (Galceran et al., 2001), a dominant activated form of Lrp6 (Lrp6ΔN) (gift from S Aaronson) (Liu et al., 2003), a stabilized form of Ctbbn1 (dBC) (Harada et al., 1999), and a dominant negative form or Rhoa (DN-Rhoa) (Gift from P Kulesa) was PCR-amplified and sub-cloned in pENTR-D/TOPO (Invitrogen). Hoxa13, Hoxc11, and Hoxd10 mutated versions unable to bind DNA (HoxmutH) were generated by mutating amino acids 50, 51, and 53 of the homeodomain to alanine (Gehring et al., 1994). When over-expressed in paraxial mesoderm precursors, these HoxmutH constructs show no effect on cell ingression, elongation velocity, and Wnt signaling (data not shown). The dominant-negative forms of Hoxd10, c11, and a13 (respectively Hoxd10dn, Hoxc11dn and Hoxa13dn) were generated by inserting a stop codon instead of the amino acid 50 of the homeodomain. Chimeras for Hox genes were generated by fusion PCR. The homeodomain sequence of Hoxa13 was fused to the N-ter and C-ter of Hoxa5 to generate Hoxa5Ha13. The homeodomain of Hoxa5 was fused to the N-ter and C-ter of Hoxa13 to generate Hoxa13Ha5. The N-ter of Hoxa13 was fused to the homeodomain and C-ter of Hoxa5 to generate NHoxa13HCa5. The Cter of Hoxa13 was fused to the Nter and homeodomain of Hoxa5 to generate Hoxa5Ca13. The homeodomain of Hoxa5 was fused with either the Nter and Cter of Hoxc11 or the Nter and Cter of Hoxa13 to generate Hoxc11Ha5 and Hoxa13Ha5, respectively. The chimeras were cloned in pENTR-D/TOPO to generate entry clones. Entry clones were then cloned in destination vectors (depending on the experiments) using Gateway technology (Invitrogen). For consecutive electroporations and luciferase assays, a pCAGGS-IRES2-Venus-RFA destination vector was generated as follows: a yellow fluorescent protein (YFP), Venus, with two sites of myristoylation that target the fluorescent protein to the membrane (Venus, gift from K Hadjantonakis) (Rhee et al., 2006), was fused to an Internal Ribosomal Entry Site (IRES2) (Clontech) by PCR. The primers used contained an EcoRI site in 5′ and a NotI site in 3′. The EcoRI/IRES2-Venus/NotI fragment was then cloned into the EcoRI-NotI restriction sites of pCAGGS. A Gateway cassette (RFA, Invitrogen) was then inserted into the EcoRV site of the pCAGGS-I2-Venus, upstream of the IRES2. For axis elongation measurements and cell tracking experiments, a pCI2HV-RFA destination vector was generated as follows: a YFP protein, Venus, was first fused to the full-length coding sequence of histone H2B to target the fluorescent protein to the nucleus (H2B-Venus). The H2B-Venus PCR fragment was then fused by PCR to an IRES2 (Clontech). The primers used contain an EcoRI site in 5′ and a NotI site in 3′. The EcoRI/IRES2-H2B-Venus/NotI fragment was then cloned into the EcoRI-NotI restriction sites of pCAGGS. A Gateway cassette (RFA, Invitrogen) was then cloned in the EcoRV site of the pCI2HV, upstream of the IRES2. For luciferase assay experiments, the chicken T promoter (1 kb upstream of the ATG) was PCR-amplified and cloned upstream of the firefly luciferase in the pGL4.10 (luc2) vector (Promega) to generate the cTprLuc reporter. Expression driven by this promoter fragment in chicken embryo recapitulates the PM expression of T (not shown). The Wnt/βcatenin pathway activity reporter (seven TCF/LEF binding sites + siamois minimal promoter) was PCR amplified from the BAT-GAL plasmid (Addgene plasmid 20889) (Maretto et al., 2003) and cloned upstream of a firefly luciferase in the pGL4.10(luc2) vector (Promega) to generate the BATLuc reporter. RNA interference experiments were performed using 21-nucleotide dsRNAs (Dharmacon, Option A4). To identify electroporated cells, siRNAs (suspended in TE to a final concentration of 5 mg/ml) were mixed with a pCAGGS-Venus or Cherry expression plasmid (1.0 mg/ml). The target sequence against chick Pbx1 was as follows: 5′- GTGTGAAATCAAAGAGAAA-3′. As a control siRNA, we used a siRNA targeting chick Pbx1 containing two point mutations (underlined in the sequence): 5′-ACACAAAGCTGAAGAAGTA-3′ that show no effect on Pbx1 expression. To monitor the Pbx1 siRNA efficiency, the anterior primitive streak of stage 4 HH embryos was electroporated with either control siRNA or Pbx1 siRNA mixed with a pCAGGS-Venus expression plasmid (1.0 mg/ml). Embryos were reincubated at 38°C until they reach stage 7 HH when they were harvested and processed for ISH for Pbx1 and immunofluorescence against GFP. A pBIC control vector (derived from the pBI-tet [clontech] in which Cherry has been cloned) (gift from J Chal) that allows simultaneous expression of two proteins at the same level once activated by doxycycline (Tet-on, Clontech) or the pBIC vector containing the full length Pbx1 along with a vector expressing the rtTA (Clontech) were electroporated in PSM progenitors at Stage 5 HH. Embryos were reincubated until they reach the 3-somite stage. They were then placed on imaging plates containing 0.5 μg/ml doxycycline for 1 hr at 38°C before starting acquisition. Axis elongation measurements were performed as described below between 5 and 9-somite stages. Electroporated embryos were cultured ventral side up on a microscope stage. We used a computer controlled, wide-field (10× objective) epifluorescent microscope (Leica DMR) workstation, equipped with a motorized stage and cooled digital camera (QImaging Retiga 1300i), to acquire 12-bit grayscale intensity images (492 × 652 pixels). For one embryo, several images at different focal planes and different fields were captured at a single time-point (frame). The acquisition rate used was 10 frames per hour (6 min between frames). Image processing, including focal plane ‘collapsing’ field merging and registering, was performed to create high-resolution, 2D time-lapse sequences for cell tracking and axis elongation measures (see Czirók et al., 2002, for details). To correct for the gradual drift of the embryo position or sudden changes due to repositioning of the microscope stage, images were registered to the embryo center. Variation of the distance between a formed somite and the node was used to determine the velocity of body axis elongation. The coordinates of the different points were determined on bright-field images of the time-lapse experiments using the cellular tracking option of ImageJ. ImageJ is a public domain, Java-based image processing program developed at the National Institutes of Health. For wild-type embryo measurements, axis elongation velocity was measured between 1 and 3 somites (n = 8), between 5 and 7 somites (n = 8), between 9 and 11 somites (n = 6), between 15 and 17 somites (n = 5), between 20 and 22 somites (n = 6), and between 25 and 27 somites (n = 8). For 15–17 somites measurements, embryos were cultured starting at 13 somites and imaged until 18 somites. For 20–22 somite measurements, embryos were cultured starting at 18 somites and imaged until 23 somites. For 25–27 somites measurements, embryos were cultured starting at 23 somites and imaged until 28 somites. For measurements of axis elongation velocity after Hox or T over-expression, electroporated embryos at stage 5 HH were cultured in a humidified incubator at 38°C for 3 hr and then placed on the microscope stage, as described above, for 18 hr. Axis elongation velocity was measured for 10 hr, starting from the 5-somite stage. Student's t-tests were applied to evaluate the differences between conditions. Cells electroporated with either a control or a Hox gene and a nuclear fluorescent protein (H2B-Venus or H2B-GFP) were automatically tracked using the Imaris software's cell tracking module (version 7.3.1). Cells were segmented based on nucleus size (set at 5 μm) and fluorescence intensity. The tracking algorithm was based on Brownian motion. Only cells in the posterior PSM were tracked for 10 hr. To substract the tissue motion to the single cell motion, the average speed of all tracked cells, that represent the tissue motion, has been substracted from the average speed of each individual cell (as described in Bénazéraf et al., 2010). Student t-tests were applied to evaluate the differences recorded between the different conditions. Embryos were harvested at stage 5 HH and electroporated with a DNA mix containing either cTprLuc or BATLuc (1 μg/μl final), CMV-Renilla (Promega, Madison, WI) (used as a control to normalize the differences of electroporation intensity between embryos [0.2 μg/μl final]), a control pCAGGS-Venus vector (gift from K Hadjantonakis) or a gene of interest cloned in pCAGGS-IRES2-Venus (5 μg/μ; final). Electroporated embryos were cultured in a humidified incubator at 38°C for 20 hr. Embryos were analyzed using a fluorescent microscope and only embryos showing restricted expression of Venus in the paraxial mesoderm were selected (90–100% of the electroporated embryos) for luciferase assay (between 3 and 5 embryos for each condition). The posterior region (from somite 1 to tail-bud) of the selected embryos was dissected and lysed in passive lysis buffer (Promega) for 15 min at room temperature. Lysates were then distributed in a 96-well plate and luciferase assays were performed using a Centro LB 960 luminometer (Berthold Technology, France) and the dual luciferase kit (Promega) following manufacturer's instructions. Raw intensity values for Firefly luciferase signal were normalized with corresponding Renilla luciferase values (RLU) and the control experiment was set to 1. Student t-tests were applied to evaluate the differences between conditions. For Hox dominant-negative experiment, embryos were electroporated at st8 HH with a mix containing BATLuc, CMV-Renilla and either a Hoxa13mutH or a mix of Hoxc11mutH and Hoxa13mutH or a mix Hoxd10mutH, Hoxc11mutH and Hoxa13mutH (in pCAGGS-I2-Venus [control condition]) or Hoxa13dn, or a mix of Hoxc11dn and Hoxa13dn or a mix of Hoxd10dn, Hoxc11dn and Hoxa13dn (in pCAGGS-I2-Venus [mutant condition]). Embryos were reincubated until they reach the 28-somite stage. The tail-bud of each embryo was dissected and used for the luciferase assay as described above. Stage 5 HH embryos electroporated with either a control pCI2HV or a pCI2HVHoxa13 vector were cultured in a humidified incubator at 38°C for 6 hr. Embryos were then selected using a fluorescence stereomicroscope based on electroporation efficiency. Selected embryos were fixed for 30 min at room temperature and then cryo-preserved in 30% sucrose in PBS at 4°C. Embryos were then transferred in a solution containing 7.5% gelatin and 15% sucrose in PBS and placed at 42°C. Embryos were then included in a cryosection mold and flash frozen in a dry ice-ethanol bath. 12-μm transverse cryosections of the electroporated region were prepared using a Leica CM3050 S cryostat. Sections were collected on superfrost slides and stored at −20°C. For immunocytochemistry, sections were placed in warm PBS (42°C) for 5 min to remove gelatin. Sections were incubated with the primary antibody in PBS/BSA (2%)/Triton (0.1%) for 2 hr in a humidified chamber at room temperature. Slides were then washed four times for 15 min in PBS and incubated with the secondary antibody in PBS/BSA (2%)/Triton (0.1%) for 45 min in a humidified chamber. For the cell ingression assay and the labeling of the extracellular matrix (ECM), we used, respectively, a rabbit anti-GFP (abcam, #ab290, UK) at 1/2000 and the mouse anti-laminin (DSHB, #3H11, Iowa City, IA) at 1/200. The secondary antibodies were anti-rabbit Alexafluor488 (Invitrogen) and anti-mouse IgG1Alexafluor555 (Invitrogen), respectively, used at 1/1000. DAPI (Invitrogen, 1/1000 dilution) and an Alexafluor 633 phalloidin (Invitrogen) were applied at the same time as the secondary antibodies to label the nuclei and the F-actin, respectively. For tubulin labeling, we used the mouse anti-acetylated alpha-tubulin (sigma T6793) at 1/1000. The secondary antibody was an anti-mouse IgG2b Alexafluor546 (Invitrogen), used at 1/1000. Slides were mounted in Fluoromount-G (SouthernBiotech) and analyzed with a LSM 510 NLO inverted confocal microscope (Carl ZEISS, Germany) using a plan apochromat 63× (NA 1.4) immersion (oil) objective (Carl Zeiss). A pBIC control vector (described above) or the pBIC vector containing the full-length Hoxa13 with a C-terminal HA tag along with a vector containing EGFP under the CAGGS promoter and a vector expressing the rtTA (Clontech, France) were electroporated in the PM progenitors at stage 5 HH. A drop of 50 μl of different doses of doxycyclin (from 50 μg/ml to 0.5 μg/ml) was applied on top of the embryos immediately after electroporation and the embryos were reincubated for 20 hr. Three embryos for each condition were individually lysed following standard procedure and each lysate was loaded on a different well of an SDS-page gel. Western blot analysis was done following standard procedure. An anti-HA-HRP antibody was used to detect Hoxa13 (Roche #12013819001, dilution 1/1000, Germany). An anti-GFP antibody (abcam ab6556, dilution 1/2000) was used to detect GFP from the pCAGGS-EGFP used as an electroporation control. An anti-β actin antibody (Sigma A5441, dilution 1/5000, Germany) was used to verify that the same amount of tissue was loaded in each well. This experiment has been repeated twice independently. A 20 μl drop of 100 µM EdU (Click-iT EdU kit, Cat. #C10083 Invitrogen) was applied on the posterior region of 20–22- and 25–27-somite stage embryos cultured in vitro for 45 min. Embryos were then immediately fixed in 4% paraformaldehyde (PFA) for 45 min at room temperature (RT) and were then processed as described in Warren et al. (2009). Phospho-histone H3 (pH3) (Millipore, #06-570, 1/1000 dilution, France) immunolabelling was performed after the EdU reaction. Single plane sections were generated, and the PSM region was manually segmented. For the tail-bud proliferation assay, parasagittal cryosections (20 µm) were made. Nuclei labeled with DAPI and EdU and/or pH3 were manually counted. Sections were imaged using a Zeiss 510 NLO and a 20× dry NA0.8 objective. Embryos were harvested at 20–22- and 25–27-somite stage and processed as described (Smith and Cartwright, 1997) using the ApopTag Red In Situ kit (#S7165; Millipore). Single plane sections were generated and the PSM region was manually segmented. For tail-bud apoptosis assay, parasagittal cryosections (20 µm) were made. Nuclei labeled with DAPI and/or apoptotic labeling were manually counted. Labeled embryos were imaged using a Zeiss 510 NLO and a 20× dry NA0.8 objective. PM precursors of the anterior primitive streak of Stage 5 HH embryos were electroporated as previously described either with a control vector coding for a H2B-venus fusion (pCI2HV) or a vector coding for Hoxa13 and a H2B-venus fusion (Hoxa13pCI2HV). Embryos were reincubated for 14 hr in a humidified incubator at 38°C until they reach the 9-somite stage. The region containing the PM progenitors was dissected from several embryos and pooled in a drop of PBS/FCS1% (seven embryos per condition) on ice. Dissected tissues were then transferred in a drop of diluted trypsin and incubated at 38°C for 10 min to allow efficient enzymatic dissociation of cells. Cell dissociation was completed mechanically by pipetting up and down. Cells were then transferred into 500 μl of PBS/FCS 1% on ice and sorted based on YFP fluorescence using a FACS DIVA (BD technologies, France). For each condition, one thousand YFP+ cells were collected directly in Trizol (Invitrogen) and immediately frozen at −80°C. This experiment was repeated twice independently. Extraction of total RNA was performed according to manufacturer's instructions (Trizol, Invitrogen). Biotinylated cRNA targets were prepared from total RNA using a double amplification protocol according to the GeneChip Expression Analysis Technical Manual: two-Cycle Target Labeling Assay (P/N 701021 Rev.5, Affymetrix, Santa Clara, USA). Following fragmentation, cRNAs were hybridized for 16 hr at 45°C on GeneChip Chicken Genome arrays. Each microarray (one microarray per condition = two control microarrays and 2 Hoxa13 microarrays) was then washed and stained on a GeneChip fluidics station 450 and scanned with a GeneChip Scanner 3000 7G. Finally, raw data (.CEL Intensity files) were extracted from the scanned images using the Affymetrix GeneChip Command Console (AGCC) version 3.1. CEL files were further processed with MAS5 and RMA algorithms using the Bioconductor package (version 2.8) available through R (version 2.12.1). Probe sets were filtered based on their expression intensity value (MAS5 value). Probe sets with an intensity value under 100 were discarded. Probe sets were ranked based on fold change between the intensity value of the control condition and the Hoxa13 over-expression condition. The microarrays raw data are available on the GEO website (http://www.ncbi.nlm.nih.gov/geo/query/acc.cgi?acc=GSE38107). RNAs from the microarray experiments were used as templates for cDNA synthesis using the Qantitect kit (Qiagen). 3 μl of cDNA was mixed with 6 μl of 2× Lightcycler 480 SYBR green I master (Roche) and 1 μM of primers (listed in Table 2) in a total volume of 12 μl. The Q-PCR reactions were run on a Lightcycler 480 (Roche) with the Lightcycler 480. Each sample was run in duplicate and gapdh was used as a control gene. The CT values obtained for each gene were normalized against the CT value obtained for gapdh. PM precursors of the anterior primitive streak of Stage 8 HH embryos were electroporated as previously described either with a mix of control vectors coding for Hoxd10mutH, Hoxc11mutH and Hoxa13mutH in pCAGGS-IRES2-Venus or a mix of vector coding for Hoxd10dn, Hoxc11dn and Hoxa13dn in pCAGGS-IRES2-Venus. Embryos were reincubated in a humidified incubator at 38°C until they reached the 28-somite stage. Tail-bud regions containing the PM progenitors were then dissected and pooled in a drop of PBS/FCS1% (three embryos per condition) on ice. Dissected tissues were then transferred into a drop of diluted trypsin and incubated at 38°C for 10 min to allow efficient dissociation of the cells. The dissociation of cells was completed mechanically using a glass micropipette by pipetting up and down. Cells were then transferred into 500 μl of PBS/FCS1% on ice and sorted based on YFP fluorescence using a FACS DIVA (BD technologies). For each condition, one thousand YFP+ cells were collected directly in Trizol (Invitrogen) and immediately frozen at −80°C. This experiment was repeated four times independently. Extraction of total RNA was performed according to manufacturer's instructions (Trizol, Invitrogen). RNAs were used as templates for cDNA synthesis using the QuantiTect kit (Qiagen). 3 μl of cDNA was mixed with 6 μl of 2× Lightcycler 480 SYBR green I master (Roche) and 1 μM of primers (listed in Table 2) in a final volume of 12 μl. The Q-RT PCR reactions were run on a Lightcycler 480 (Roche). Each sample was run in duplicates, and gapdh was used as a control. The CT values obtained for each gene were normalized against the CT value obtained for gapdh. Embryos were harvested in PBS at different stages (10, 15, 20, or 25-somite stages) and pined using 0.10 mm minutiens on a silicon-coated petri dish. The tailbud region was then microdissected using a sharpened tungsten needle and care was taken to remove the endoderm and the ectoderm. Each individual tailbud was immediately transferred in 500 μl of Trizol (Invitrogen) in a 1.5 ml RNAse free tube (Ambion) on ice until five individual tailbuds were collected per stage (resulting in five tubes per stage). Then the tubes were immediately frozen at −80°C. Extraction of total RNA was performed according to manufacturer's instructions (Trizol, Invitrogen). RNAs were used as templates for cDNA synthesis using the iScript reverse transcriptase Supermix (Biorad). 3 μl of cDNA was mixed with 5 μl of 2× SSoAdvanced universal SYBR green supermix (Biorad) and 1 μM of primers (listed in Table 2) in a final volume of 10 μl. The Q-RT PCR reactions were run on a CFX384 (Biorad). Each sample was run in triplicates, and gapdh was used as a control. The CT values obtained for each gene were normalized against the CT value obtained for gapdh. In: E Bellairs, JW Lash, editors. Somitogenesis in developing embryos. New York and London: Plenum Press. pp. 161–178. Annual Review of Cell and Developmental Biology 29:1–26. Proceedings of the National Academy of Sciences of USA 98:8668–8673. Journal of Experimental Zoology Part B, Molecular and Developmental Evolution 312:533–544. Proceedings of the National Academy of Sciences of USA 104:2744–2749. Current Opinion in Genetics & Development 22:374–380. Molecular and Cellular Biology 23:5825–5835. Proceedings of the National Academy of Sciences of USA 100:3299–3304. Proceedings of the National Academy of Sciences of USA 108:4018–4023. Current Topics in Developmental Biology 104:113–148. In: M Bernfield, editors. Molecular basis of morphogenesis. New-York: John Wiley and Sons. pp. 165–176. Thank you for sending your work entitled “Hox genes control vertebrate body elongation by collinear Wnt repression” for consideration at eLife. Your article has been favorably evaluated by Janet Rossant (Senior editor), Marianne Bronner (Reviewing editor), and three reviewers. The Reviewing editor and the three reviewers discussed the comments before we reached this decision, and the Reviewing editor has assembled the following comments. It is the policy of eLife to only ask for revisions that can be accomplished in a reasonable time. Given the extensive revisions that would be required to satisfy the reviewers' concerns, we cannot accept your paper for publication at this time. However, we would be open to considering a new submission at a later time that addresses the reviewers’ comments after completion of further experiments and addition of extensive revisions to the text. The manuscript by Denans, Iimura and Pourquie presents evidence for a role of Hox genes in mesoderm ingression and body elongation in vertebrates. They test the interesting hypothesis that some posterior Hox genes repress Wnt and FGF signaling and so decrease expression of mesodermal gene T, which then leads to reduced ingression of cells through the primitive streak. This eventually leads to termination of the body elongation process by lack of available mesoderm. In this view, 'posterior Hox genes' regulate the extension of the body plan by indirectly controlling the amount of available mesoderm cells in the tail end of the embryo (via the regulation of cell ingression from the epiblast). This is an interesting piece of work, which adds important arguments supporting the function of Hox genes during the elongation of the vertebrate body axis. However, the reviewers raised major concerns regarding technical approaches, the lack molecular explanation for the described phenomena, and appropriate reconciliation of the authors’ conclusions with previously published work. Additional control experiments and further discussion of the literature as suggested below are required to substantiate if the proposed mechanism indeed holds true. 1) One concern is the quantification of all the various phenomenon described in this work. There are several parameters, which can easily escape control in this context (mRNA stability, protein presence, electroporation success, copy number, saturation etc.). This criticism is not particular to this work and a similar question could be asked regarding the results by others in mice in mice, where the strong effect was not explicitly related to a 'physiological' gain of function (even though it may indeed be the case). Vertebral formula is very stable within the same species and thus must rely upon a robust mechanism. How the robustness of this process relates to the quantities of factors is a key issue (are these factors saturating?) At the time of the start of decreasing Wnt signaling due to increasing Hox amounts, a rather smooth gradient of T must be established. At these time points, genetic conditions in mice would be expected to have an effect perhaps stronger than what was reported by Capecchi for the Hoxb13 mutants? And if several Hox genes contribute to this phenomenon, then how to prevent intra-species variations, in particular at the time-points when the system would no longer be saturated? 2) From this model, one can make rather strong predictions, such as e.g. that the addition of yet another Hox cluster with posterior genes should make the body shorter? Is this the case in the literature? 3) There are important differences in effects between the Hoxa13 and Hoxd13 genes. In many developmental contexts, these two genes have very redundant functions and therefore, the difference reported here would suggest that Hoxa13 achieves its function in the tailbud by affecting a pathway or by using a peptide sequence that is not associated or existing in Hoxd13? This is particularly unexpected, as Hoxd13 (at least in mammals) seems to be expressed in the late tail bud more strongly than Hoxa13. This should be discussed. 4) A major claim of the authors is that there is delayed ingression, but this is not convincing. They report delayed expression of the Hox-Ires-Venus cassettes following electroporation into the chick epiblast as measured by Venus protein fluorescence. The authors interpret this effect such that Hox gene over-expression can delay ingression of the cells receiving the construct. However, the Hox constructs are driven by the ubiquitous Caggs promoter. Why is expression of the Hox constructs not observed at the same time as that of the control construct? A simple explanation might be that the RNA derived from these constructs is post-transcriptionally controlled, either by immediate degradation or by translational repression. This might assure position-adequate activity of the Hox genes. RNA in situ hybridization experiments testing for the time and position of transcription of the constructs are missing. However, they are required at least for some of the constructs. In addition, co-transfection of the control reporter construct with the Hox expression constructs should reveal if indeed ingression is delayed by Hox over-expression. Furthermore, RNAi of critical Hox genes (e.g. Hoxa13) would be a means of testing if the proposed effect of Hox genes can be opposed. 5) Critical missing data are the level of Brachyury expression along the body axis. If the authors are right that increasing Hox gene expression has a repressive effect on Brachyury expression resulting in decreasing mesoderm formation and motility along the body axis, this should be reflected by decreasing Brachyury transcription in the wild-type embryo as it elongates. Is this the case? Of course this would mean measuring expression levels per mesoderm cell (e.g. FPKM or qPCR values determined on FAC sorted cells) at different embryonic stages but at the same axial position (e.g. close to the node), not just overall expression in the embryo. The authors have all the tools at hand for doing the test. 6) It is not clear if the data from chick can be extrapolated to vertebrates in general. If the proposed mechanism were generally true, vertebrates with tails should not exist. 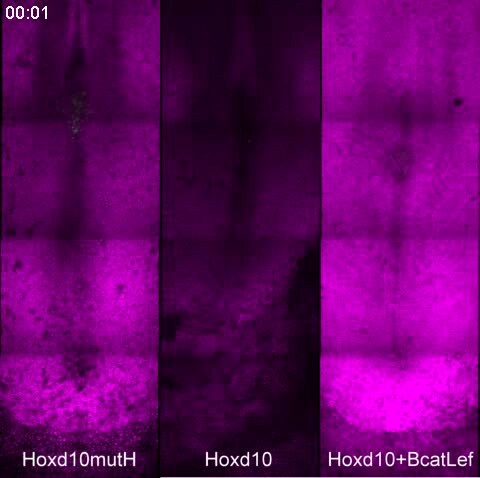 All Hox genes are already activated during trunk development and the tail does not gain extra Hox activity grinding Brachyury expression eventually down to a standstill. Thus in tailed animals a different mechanism is more likely. The authors therefore should present their conclusions with respect to the chick and possibly other vertebrates with tiny tails (humans, some monkeys?). 7) The accuracy of the experimental approaches is difficult to assess, in particular, the accurate and reproducible targeting of the epiblast layer of the primitive streak by electroporation is not documented. It seems likely that there is some variability between embryos and that in some cases cells that are already ingressing are targeted. Furthermore, it seems possible that control cells are sometimes affected by Hox mis-expressing cells in the primitive streak, making this assay difficult to interpret with confidence, particularly when only a handful of embryos are analyzed for each gene. A data set demonstrating localized epiblast targeting reproducibility would strengthen the claims of the authors that they are assessing regulation of the ability of mis-expressing cells to ingress. It is also concerning that the arrow indicating the most rostral red fluorescent label in Figure 3B is mis-placed caudally. 8) The time difference between “successive” electroporations should be clarified; if the first construct labels cells earlier then these will progress to a more rostral position than cells electroporated slightly later, which could result in a misleading conclusion that the second construct used delays ingression. It seems the control construct is always electroporated first; can the authors invert the order in which the constructs that induce a delay are electroporated and obtain the same result? 9) There is no explanation at a molecular level for differences in the ability of posterior Hox genes to delay ingression nor for the effect of posterior dominance within the subset of posterior Hox genes that appear to affect ingression. How does collinear onset of posterior Hox genes lead to progressive loss of Wnt/FGF and T if this does not involve protein accumulation? Identifying these molecular mechanisms is needed to take the paper beyond the discovery of an interesting phenomenon. 10) We are left at the end of the paper without a molecular explanation for how Hox genes influence the ingression of cells. It is surprising that a gene that leads to reduced Wnt and FGF signaling in primitive streak epiblast does not affect cell adhesion and E-cadherin expression (data for which is not shown) nor the balance of Sox2/T expression in this cell population which would lead to cells adopting a neural over a mesodermal fate. Previous work has shown that FGF signaling is upstream of E-cadherin downregulation, prompts EMT and formation of T expressing mesoderm at the mouse primitive streak (Ciruna and Rossant, 2001, Dev. Cell), while more recent work has demonstrated that high Wnt signaling promotes mesoderm differentiation from neuro-mesodermal (Sox2/T co-expressing) progenitors and that reduced Wnt signaling in this context leads to neural differentiation (Tsakiridis et al, 2014, Dev; Gouti et al, 2014, PLOS Biology). Other work, in chick, analyzing the expression of Sox2 and T transcription throughout body axis elongation shows that strong T persists in the tailbud long after the 25 somite stage, declining only just prior to cessation of elongation at ∼ 44 somite after which T begins to decline and Sox2 is up regulated in tailbud cells, in a step that involves decreased FGF signaling (Olivera-Martinez et al, 2012, PLOS Biology). Indeed, Tenin et al, 2010, BMC Dev. Biol. show that elongation cessation takes place when the presomitic mesoderm is still present at HH24 (rather than having been used up by somites forming right to the tail tip), suggesting that the body axis does not end due to a lack of ingressed cells. This observation contradicts the main conclusion of this current paper that it is a lack of ingressed presomitic cells that underlies elongation arrest. 11) The authors present only Sox2 in situ data (Figure 2–figure supplement 2) in whole mount embryos to support their claim that there is not a cell fate change when Hoxa13 is mis-expressed. Sections of such embryos in which the Hoxa13 GFP construct is visible with the Sox2 in situ signal on a cell by cell basis is required for convincing evidence on this point. 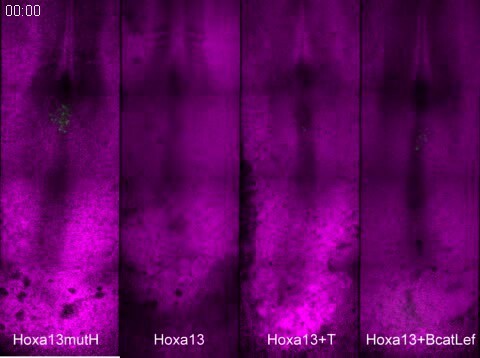 A further possibility is that Hoxa13 expressing cells simply down regulate T but remain Sox2 positive and so adopt a neural fate and therefore do not ingress. Again comparing control and Hoxa13 GFP positive cells for levels of T and Sox2 on a cell-by-cell basis may provide evidence for the decline in T and maintenance Sox2. 12) It is not clear why the authors provide in situ images for T and Fgf8 at HH14 (Figure 5) using an intronic probe; other genes are not assessed in this way and no comment or explanation is provided in the text or figure legend. It is not clear how this data compares with published work showing strong and extensive T transcripts until the end of axis elongation. The authors need to address this difference with previous work, explain the significance of loss of active T transcription and consider how T transcripts continue to be regulated by FGF in the tailbud at these late stages (Olivera-Martinez et al, 2012) if the gene is not actively transcribed. One logic may be that the effects of endogenous posterior Hox genes are very small and slow acting, however, the authors appear to argue that there is a step change as the tailbud forms and the image presented in Figure 5F implies that T transcripts are lost in the tailbud at this time. Overall, this paper presents a striking phenomenon in the regulation of cell ingression through the primitive streak by posterior Hox genes and some very interesting data that explain to some extent the molecular mechanisms at play here. The authors still need to place the work in an appropriate context both in terms of the literature and the significance of this mechanism during body axis elongation; it may be that collinear activation of posterior Hox genes regulates tailbud morphogenesis half way through axis elongation, but does not directly regulate PSM length. 1) The role of RhoA is not sufficiently well investigated and documented for giving it a prominent role in the Abstract. If the authors find this point so important they should provide some more experimental support. Alternatively they may want to rewrite the Abstract. 2) Last line of the Abstract (end of the Introduction and elsewhere,): “this mechanism leads to progressive reduction of PSM size associated to the arrest of somitogenesis” does not follow logically. What does this mean if it is clear that, at least in the chick, body axis elongation ceases when the PSM is still present and there is room for more somites to be generated? How is ingression then associated with arrest of somitogenesis? Somitogenesis arrest is more likely linked to loss of Notch pathway oscillations in the remaining PSM (Tenin et al, 2010). 3) In the Introduction the authors should mention the evidence that explanted chick tailbuds (i.e. without somites) are a demonstrated source of RA (Tenin et al, 2010). This is an important finding, which bears on their hypothesis that shortening of the PSM is a major step in that brings retinoic acid to tailbud and so curtails body axis elongation. It may be that both mechanisms operate and I think this should be made clear upfront, rather than appearing later in the Discussion. 4) In the Introduction and elsewhere it is confusing to state that “Hoxb genes are only expressed in anterior regions of the embryo precluding their playing a role in the control of axis extension”, when Hoxb13 is known to regulate axis elongation. They need to be more precise, Hoxb1-9. 5) It would be informative to explain in the paper that the 25 somite stage is ∼when the tailbud forms and that this is when when cell ingression through the primitive streak ceases—refer to work from Susan Mackem's lab in chick showing cessation at HH stage16 (∼ 24-28 somites, Knezevic et al, 1998 and see Catala et al, 1995, and also Wilson and Beddington, 1996, in the mouse). It seems likely that the mechanism identified by the authors is most functionally significant at this mid-way stage; from then on the PSM is added to from an “internalized” set of precursor cells. McGrew et al, 2009, and Olivera-Martinez et al, 2012 identify these cell populations by lineage analysis in the chick tail bud as the NMps (Sox/bra expressing cells) and also a transit amplifying cell population of mesodermal progenitors. I think the authors should explain this in the Discussion (and in the Introduction). As the paper currently reads it might be thought that ingression through the primitive streak continues until the end of axis elongation, when in fact in both chick and mouse embryos this ceases at somite 30 of ∼50-53 (chick, HH16) and 33 of 65 (mouse, E10.5). The cessation of ingression thus fits more closely with the establishment of the tailbud about half way through body axis elongation. As Hoxb and d13 begin to be expressed just after tailbud formation, they may contribute to conclusion of the ingression process, but this early role also leaves room for other actions for such Hox genes, including the regulation of cell proliferation in the tailbud mesoderm, described by Economides et al, 2003. I think these considerations are important to clarify that the regulation of ingression that they uncover is distinct from the model they originally proposed in which this was directly linked to “exhaustion” of PSM precursors and elongation arrest. 6) Related to this the authors suggest in the Discussion that posterior Hox genes might act in place of retinoic acid as a mechanism for arresting axis elongation in mouse. However, as ingression has ceased and continued extension is due to the activity of internalized precursors it is difficult to see Hox regulation of cell ingression as a molecular explanation for axis arrest. 7) The new data localize the region of Hox genes involved, but shows that this does not contain a conserved sequence that correlates with repressive activity. We are left with further speculation that this must be due to local protein structure. Similarly, the authors may have identified a further part of the molecular mechanism that regulates cell ingression, by rescuing Hox gene induced delay by co-expression with the DN-RhoA construct. However, this simply shows that de-stabilizing microtubules can force ingression and there is no molecular link made here from Brachyury to regulation of RhoA activity. The authors have therefore made a little progress on uncovering molecular explanations for the phenomena observed when posterior Hox genes are mis-expressed. 8) Finally, the authors have attempted to determine whether Sox2 expression is present in epiblast cells that are delayed in their ingression through the primitive streak. Unfortunately, they have been unable to improve the in situ hybridization for Sox2 transcripts (even the control embryo does not reveal the normal caudal domain of Sox2 expression, which extends into the tailbud (e.g. see Uchikawa et al, 2011, Dev. Growth & Diff; Olivera-Martinez et al, 2012). The authors have also been unable to detect Sox2 protein using immunocytochemistry, and it is not clear whether this reflects a problem with antibody batches or another technical difficulty. The net result is that they do not provide any new data to address the possibility that cells fail to ingress because having reduced Wnt signaling and T expression they have lost mesodermal identity in favor of a neural fate. Given that they are unable to reproduce the Sox2 expression pattern published by many other groups, they should be cautious in the interpretation of their lower power in situ data, which leaves open the possibility that accumulating non-ingressing primitive streak epiblast cells continue to express Sox2. 1) The authors have responded with some discussion of the literature on when ingression ceases, but this is not convincing. It is certainly debatable whether movement of cells from the late chordo-neural-hinge (CNH) to the PSM is considered an ingression; the CNH is the already internalized structure derived from the primitive streak. They should clarify their interpretation. 2) The response to comment 8 is confused; expression of Sox2 in epiblast cells that fail to ingress does not automatically lead to their contribution to the neural tube. Given the poor quality data (low magnification wholemount in situs which do not recapitulate published caudal expression of Sox2 even in the controls), they should be cautious with the interpretation. We agree that the robustness of the data generated by our electroporation protocol is striking. However, even though the technique does not allow us to precisely control the number of plasmid copies per cell or the number of cells electroporated, we have well established its reliability in the lab over the past 15 years. Successful electroporations like microsurgical experiments require a thorough training, and Nicolas Denans has been practicing these experiments on a regular basis for the past 6 years. The quantitative analysis of the different phenotypes shown in the paper clearly demonstrates that these experiments give highly consistent results with most embryos overexpressing a given construct showing a similar phenotype which is specific for the construct (see graphs in Figure 3C, Figure 3–figure supplement 1B, 6C, 9B). Regarding mRNA stability, we overexpress only the coding sequences (without UTRs) and use the same SV40 polyA signal for all of our constructs. Also in most cases, Hox genes are expressed from an IRES-YFP vector and thus Hox expression can be indirectly monitored by examining YFP fluorescence. All Hox genes are expressed from the CAGGS promoter which is a strong promoter and which is expected to generate expression levels higher than the endogenous ones. Moreover, we clearly show in Figure 6F-H that the quantity of Hox protein overexpressed does not affect the phenotype observed. So our conditions are saturating, abolishing any effect of gene dosage of the overexpressed Hox genes and leaving the differences only due to the nature of the Hox genes overexpressed. These observations are consistent with the analysis of paralog knock-out experiments from Deneen Wellik (Wellik et al, Science, 2003; McIntyre et al; Development, 2007)) showing that leaving only one single wild type allele leads to a much milder phenotype than the deletion of an entire paralog group. These experiments also confirm previous results published in Iimura and Pourquie (Nature, 2006) showing that Hoxb genes expression driven by promoters of different strength (CMV, TK and CAGGS) leads to similar ingression phenotypes. Our data suggest that the quantitative effects on ingression result from the progressive expression of more posterior genes. The fact that 8 of the 16 posterior Hox genes from all posterior paralogs groups except Hox12 show an effect in the ingression, elongation and Wnt signaling assays argue for an extreme redundancy of the system that could explain the intraspecific robustness of the vertebral formula. We now discuss these ideas in more detail in the revised version of the text. At the time of the start of decreasing Wnt signaling due to increasing Hox amounts, a rather smooth gradient of T must be established. We have now analyzed by qPCR the expression of the Wnt targets T/Brachyury, Axin2 and Fgf8 in the tail bud from the 10 to 25-somite stage (Figure8 C-E). These new data show that repression of Wnt targets parallels activation of posterior Hox genes in vivo starting with a smooth gradient until the 20-somite stage. A significant drop in expression is then observed at the 25-somite stage, which corresponds to the time at which axis elongation drops abruptly when Hox13 genes are first expressed. This data has been added to the text and is shown in Figure 8C-E.
At these time points, genetic conditions in mice would be expected to have an effect perhaps stronger than what was reported by Capecchi for the Hoxb13 mutants? In null mutant mice embryos for Wnt3a or T, the first 7 to 9 somites form normally (Takada et al, 1994, Genes and Dev; Wilson et al, Development, 1993), and the body axis is truncated posterior to this level. This phenotype is much stronger than that reported for Hoxb13 in which only the tail part of the axis is affected. In the experiments performed by Deschamps and Mallo where they overexpress Hox13 paralog genes in the paraxial mesoderm along the entire AP axis, these genetic conditions result in axis truncations, occurring posterior to the thoracic level (Young et al, Dev Cell, 2009). Strikingly no effect in the anterior regions is seen in these transgenic animals. 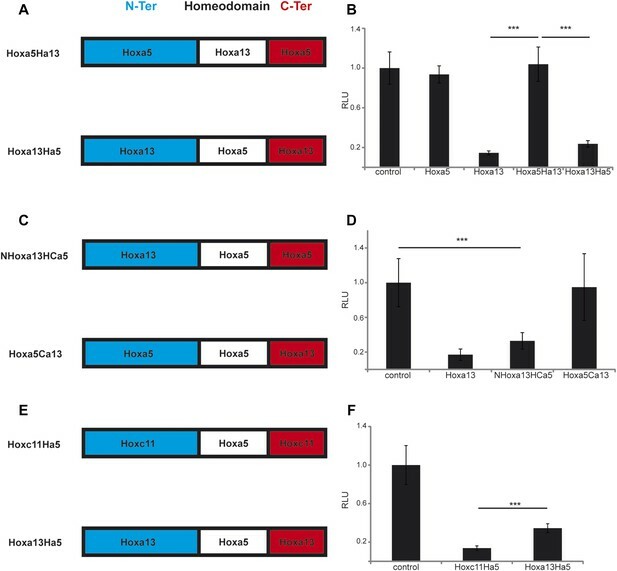 The phenotype of these animals resembles hypomorphic Wnt3A or T mutants suggesting that the Wnt repression by posterior Hox genes is not an on-off mechanism but rather a quantitative effect. This notion is further supported by the different truncation levels reported for Hoxa13, Hoxb13, and Hoxc13 expressed from the same promoter in mouse (Young et al, Dev Cell, 2009). These experiments are consistent with the notion that Wnt and T play an important role in the control of axis elongation from the cervical to the caudal level and that posterior Hox genes quantitatively modulate Wnt activation in the paraxial mesoderm precursors of these regions. We now discuss these points in the revised version of the manuscript. And if several Hox genes contribute to this phenomenon, then how to prevent intra-species variations, in particular at the time-points when the system would no longer be saturated? Our experiments reported here (Figure 6) and in show that concentrations of Hox proteins exhibit a similar effect over a large dilution range (Figure 6) suggesting that low levels of Hox proteins are saturating. This property is expected to confer significant robustness to the system in line with the limited intra-species variations observed. It is true that zebrafish which has extra Hox clusters exhibits a shorter axis when compared to mouse or chicken while snakes which contain less posterior Hox genes expressed in the tailbud region (Di-Poi N. et al, Nature, 2010) make a much longer axis. However, whether this can be generalized will require further studies. The Duboule lab has generated transgenic mice with a human HoxD cluster or an extra mouse HoxD cluster (Spitz et al, Genes and Dev, 2001). Since the effect of Hox proteins is saturating, duplicating an existing cluster is expected to act on expression levels (rather than timing) of the Hox proteins and thus is not expected to interfere with axis elongation. Accordingly, they did not observe any change in the vertebral counts in these transgenic animals. They also have performed many duplications and deletions within the HoxD cluster and shown that these manipulations can lead to heterochronic expression of HoxD genes in the tail bud. However, they do not report any significant variations in vertebral numbers in these cases either (Tarchini et al, Dev Cell, 2006; Tschopp et al, PLOS Genet, 2009, Denis Duboule, personal communication). Importantly, all these genetic manipulations have been performed on the HoxD cluster and in our hands, neither Hoxd12 nor Hoxd13 have an effect on elongation/Wnt, and the effect of Hoxd10 and Hoxd11 is weaker than that of other Hox genes thus providing a possible explanation for the lack of significant effect of this heterochronic expression of posterior HoxD genes. In contrast, heterochronic expression of other posterior Hox genes such as Hoxa13, Hoxb13 or Hoxc13 (but not Hoxd13) genes in the tail bud precursors as described in Young et al (Dev Cell, 2010; and Jacqueline Deschamps, personal communication) was shown to make the body shorter consistent with our hypothesis. We now present our results in the light of these papers in the Discussion. In mouse, a13 is the only Hox13 required for embryonic survival because its mutation blocks allantois growth is required for formation of the placenta (Shaut et al, PLOS Genet, 2008). Also whereas transgenic mice overexpressing Hoxa13 from the cdx2 promoter exhibit axis truncation (Young et al, Dev Cell, 2009), overexpressing Hoxd13 from the same promoter has no effect (Jacqueline Deschamps, personal communication). We now show that the effect of posterior Hox genes on T repression is controlled by the N-terminal domain of posterior Hox proteins (see text and new Figure 10). While we have not mapped precisely the sequences responsible for the effects described in this paper, there are very significant differences in the N-terminal regions of Hoxa13 and Hoxd13 that could explain why in the control of ingression, of elongation and of Wnt signaling, these 2 proteins show different phenotypes (see alignment in Author response image 1). We apologize if the description of our experiments was not clear enough leading the reviewer to think that there is a delayed expression of the Hox-Ires-Venus cassettes following electroporation into the chick epiblast as measured by Venus protein fluorescence. We do not claim that expression is delayed but that ingression is delayed. The two constructs (Hox-green and control-red) are electroporated one after the other (see detailed description for consecutive electroporations below) and then we routinely examine electroporated embryos 3 hours after electroporation to make sure that both control and Hox constructs are expressed at the same time in the precursors of the paraxial mesoderm in the anterior streak region. Then whereas control cells expressing Cherry start to ingress in the posterior PSM, cells expressing the Hox-IRES-GFP constructs remain in the epiblast of the anterior streak region ingressing only later. Only a subset of posterior Hox genes shows a phenotype in these experiments. This experimental paradigm was originally introduced in , see Figure 2K-O, using grafts of epiblast expressing different Hox genes. These experiments results in a gap separating the position of the anterior boundary of red control cells from the position of the anterior boundary of green Hox-expressing cells reflecting the fact that cells ingressing later become located more posteriorly. This gap is proportional to the ingression delay experienced by Hox-expressing cells. To quantitatively estimate the variation in the ingression delay, we measure the ratio between the red and the green domains in the paraxial mesoderm (Figure 3A-C). We have tried to improve the description of these experiments in the main text and in Material and methods and provide a more detailed illustrative scheme (Figure 3A). Concerning RNAi, we have attempted to block the function of several posterior Hox genes such as Hoxa13 by electroporating RNAi and in no case could we observe a phenotype. This is not unexpected, given that RNAi only achieve partial inhibition and that Hox proteins appear to be saturating even at low levels as shown in Figure 6. This led us to turn to the dominant-negative approach described in the paper. We agree with the referee and now provide this data. We have performed Quantitative-PCR on microdissected tailbuds from 10 somite stage (ss), 15ss, 20ss, 25ss for T, Axin2 and Fgf8 that clearly show a down-regulation of the expression of these 3 genes between the 10-25ss stage. This decrease parallels the slowing-down of axis elongation observed during those stages. We now include these results in Fig 8C-E and discuss them in the main text. This is a very interesting point and an additional mechanism distinct from the one reported here is possibly involved in tail growth. In chicken which lack a tail, retinoic acid (RA) was shown to play an important role in the termination of axis elongation and somitogenesis (Tenin et al, 2010; Olivera-Martinez et al, 2011). This increase in RA level is accompanied by Raldh2 reexpression in the tail bud and it triggers differentiation and death of the paraxial mesoderm precursors. Remarkably, no such increase in RA levels is observed in mouse embryos. Furthermore, a normal tail can form even in the absence of RA in the raldh2 mutant (Cunningham et al, 2011). Therefore, it could be that in mouse, termination of the axis and hence tail formation, does not result from an active RA-dependent process but simply from exhaustion of paraxial mesoderm due to the shrinking of the PSM resulting from posterior Hox genes effect on elongation. Whether this RA-dependent mode of axis termination can be more broadly generalized to species lacking a tail remains to be explored. What causes this difference is currently unknown but it could be that in chicken, specific genetic alterations of posterior Hox genes can trigger the late expression of radlh2 in the tail bud thus leading to premature termination of axis elongation. We now present these hypotheses in the Discussion of the revised version. We understand that this assay appears difficult and challenging and like microsurgical experiments, these electroporations require a significant training to position the electrode at the desired location appropriately. My lab has developed a significant expertise in the electroporation of paraxial mesoderm precursors which we pioneered (Dubrulle et al, Cell, 2001) and we have already published several papers based on this technique (Iimura an Pourquie, Nature, 2006; Iimura et al, PNAS, 2007; Benazeraf et al, Nature, 2010). Nicolas Denans has performed these electroporations on a regular basis for the last 6 years now and he can obtain very reproducible results as shown on the graphs in Figure 3C, Figure 3–figure supplement 1B, 6C, 9B. The electroporation success is first monitored 3 hours after by examining the embryos under a fluorescent stereomicroscope. Only embryos successfully electroporated in the PSM progenitors at the exact same antero-posterior level and the same medio-lateral level relative to the midline of the primitive streak are reincubated for about 20 more hours. About 10 to 20% of the embryos fail to develop because of the 2 consecutive injections/electroporations. The embryos that develop successfully are then examined for GFP expression and routinely more than 90% show restricted YFP expression in the paraxial mesoderm. Such a high level of success rate is obtained only after a long period of training. As can be seen on the embryos shown in Figure 3, Figure 6, and Figure 9 or in the movies, virtually no cells are seen outside of the paraxial mesoderm meaning that the electroporation accurately targeted the anterior streak epiblast. Since expression of the constructs is driven by the ubiquitous CAGGS promoter, even a slight inaccuracy in positioning the electrode would result in expression in the neural tube or the lateral plate. To better illustrate the accuracy of the electroporation performed, we now present a movie showing expression of a control construct electroporated in the anterior epiblast and showing the ingressing PSM cells (Video 3). Our experiments have been carefully quantified as shown on the DotPlot graphs. As can be seen in Figure 3B-C and Figure 7K, when we overexpress a cherry control followed by a venus control, cells always end up at the same AP position (with very minimal variations) which shows that this assay is particularly robust. We electroporate one side of the PS with one construct and the other side of the PS with the other construct which largely prevents one cell to receive both plasmids. We agree that in some rare cases we could electroporate some ingressing cells. These rare cells are escapers and are found located much more anteriorly than the electroporated epiblast cells. We discard those rare cells in our quantifications and Figure 3B is a good example of it. We have now introduced a more thorough discussion of these technical aspects in the text and in the Material and methods section. We now better describe our successive electroporation procedure (which we renamed consecutive electroporation for clarity) in the Methods section. We first harvest and culture the embryos on filter paper on an agar plate at room temperature (EC culture) which “pauses” the development of the embryos. We then process to two consecutive electroporations. We microinject the first construct and immediately electroporate it and right after the first electroporation we proceed the same way for the second construct. The time delay between the 2 electroporations is about 10 seconds. Moreover as the experiments are carried out at room temperature, the embryo is paused and cells do not ingress until the embryo is reincubated at 37 C. The fact that when we overexpress 2 control constructs we find the cells at the same anterior position clearly shows that the sequence of electroporation does not affect the timing of ingression (Figure 3B, 7K). In all cases we always invert the order of electroporations in the same batch of embryos (but not the side of electroporation for consistency) and do not observe any bias in the timing of ingression). We now provide a better description of the consecutive electroporation protocol in the text and Material and methods. We agree that it is indeed a very interesting question. We designed chimeras of Hox proteins to determine which domain contains the region responsible for the repressive effect of posterior Hox genes on Brachyury using the cTprLuc assay as readout. These experiments show that the N-ter region of Hoxa13 contain the repressive domain (see new Figure 10 in the revised version of the manuscript). Sequence alignment of the N-ter region of Hoxa9, d10, c11 and a13 shows limited conservation at the amino acid level suggesting that it is not a conserved amino acids domain but rather a structural domain that is responsible for the repression activity of these proteins (see Figure 10–figure supplement1). The situation we describe is reminiscent of the recently described structural colinearity observed at the Hox protein level by Richard Mann’s group (Slattery et al, 2011). A more thorough structure function analysis of the protein sequences for all these genes must be conducted but we feel like it falls beyond the scope of the present paper. 10) We are left at the end of the paper without a molecular explanation for how Hox genes influence the ingression of cells. It is surprising that a gene that leads to reduced Wnt and FGF signaling in primitive streak epiblast does not affect cell adhesion and E-cadherin expression (data for which is not shown) nor the balance of Sox2/T expression in this cell population which would lead to cells adopting a neural over a mesodermal fate. Previous work has shown that FGF signaling is upstream of E-cadherin downregulation, prompts EMT and formation of T expressing mesoderm at the mouse primitive streak (Ciruna and Rossant, 2001, Dev. Cell), while more recent work has demonstrated that high Wnt signaling promotes mesoderm differentiation from neuro-mesodermal (Sox2/T co-expressing) progenitors and that reduced Wnt signaling in this context leads to neural differentiation (Tsakiridis et al, 2014, Dev; Gouti et al, 2014, PLOS Biology). Ciruna and Rossant nicely showed that FGF positively regulates T and thus FGFR1 mutation leads to T down-regulation consequently preventing ingression, which correlates perfectly with our observations. Our data suggest that a subset of posterior Hox genes trigger some down-regulation of Wnt/T and FGF signaling which does not completely prevent ingression but delays it. We do not claim that there is no overexpression of E-cadherin but only that we do not see ectopic E-cadherin in cells overexpressing the Hox constructs. Our model, proposes that Hox genes down-regulate T expression, delaying its accumulation which is required for triggering ingression of epiblast cells by breaking down the basement membrane and undergoing EMT (see Figure 4). However, when cells overexpressing posterior Hox genes accumulate enough T protein they eventually ingress normally (like WT cells). As stated above, we do not see cells overexpressing posterior Hox genes activating Sox2 (Figure 4I-J) nor entering massively the neural tube (see Figure 3, Figure 6, and Figure 9 or supplementary videos) arguing against a conversion of epiblast cells to a neural fate by posterior Hox genes. Ingression of cells during gastrulation requires disruption of a RhoA-dependent mechanism required for stabilization of basal microtubules in epiblast cells (Nakaya Y et al, NCB, 2008). This ultimately leads to loss of cell basement membrane interaction and breakdown of the basement membrane allowing cell ingression. We now include experiments showing that co-overexpression of a Dominant-negative-RhoA construct rescues the ingression phenotype caused by Hoxa13 overexpression (see Figure 4K). This suggests that posterior Hox genes control the timing of ingression by stabilizing the connection between microtubules and the ECM rather than diverting epiblast cells to a neural fate. We now discuss these arguments in more detail in the revised text. Other work, in chick, analyzing the expression of Sox2 and T transcription throughout body axis elongation shows that strong T persists in the tailbud long after the 25 somite stage, declining only just prior to cessation of elongation at ∼ 44 somite after which T begins to decline and Sox2 is up regulated in tailbud cells, in a step that involves decreased FGF signaling (Olivera-Martinez et al, 2012, PLOS Biology). We do not claim that we have a complete downregulation of T but a slight decrease in expression over time which is not incompatible with the papers cited by the reviewers. The cited data has been obtained by ISH which is not a quantitative method. We now provide a quantitative PCR analysis of T expression between 10 and 25 somites showing that T mRNA is decreasing during this period (Figure 8C-E). Our study emphasizes the role of Hox genes in regulating axis elongation but does not address the arrest of somitogenesis per se even though our data suggest that both are linked. This reviewer is right in saying that it is unlikely to result from exhaustion of PSM precursors in the chicken embryo as there is still a small amount of PSM remaining when axis elongation stops. This might however be the case in mouse and we have amended our text accordingly. We have proposed that axis termination is caused by exposure of the tail bud to retinoic acid produced by the somitic region, which is made possible due to the shrinking of the PSM (Gomez et al, Nature, 2008). RA has been shown to down-regulate FGF signaling and to induce differentiation and death of the tail bud precursors leading to the arrest of elongation (Tenin et al, 2010, BMC Biol; Olivera Martinez et al, 2011, PLOS Biol). In line with this hypothesis, we found that Cyp26A1 which is involved in RA degradation is downregulated by Hoxa13, which was also observed by Deschamps’s group in mouse (Young et al, Dev Cell, 2009). Whether the raise in retinoids levels observed in the chicken embryo is caused by the shrinking of the PSM, which brings the RA-producing somitic region next to the tail bud or by another mechanism remains to be investigated. We now provide a more detailed description of these arguments in the new version of the manuscript. We performed sections on embryos electroporated with control or Hoxa13 vectors and processed them for ISH with a Sox2 probe but the signal was too weak to be convincingly detected in sections. We also tried to perform immuno-histochemistry for Sox2 on tailbud sections but failed to find an antibody that faithfully labels the Sox2 population in the CNH. We tried the antibody published in (Olivera-Martinez et al, 2012, PLOS Biology) but in our hands it only gives a strong background even if we dilute the antibody to 1/2000 (in the paper they use it at 1/200). It is a polyclonal antibody so it might be related to batches issues (we tried 2 batches). Importantly, the descendants of the epiblast cells overexpressing posterior Hox genes are always found in the paraxial mesoderm and rarely in the neural tube (see Figure 3, Figure 6, and Figure 9 or supplementary videos). This further indicates that Hox overexpressing cells do not convert to a Sox2 positive neural fate. We have added this important argument to the text of the revised version. T and Fgf8 are highly expressed genes and the exonic probes for these genes saturate extremely rapidly, even when we develop the embryos at 4 degrees, which makes it extremely difficult to quantify a slight change in gene expression. This is why we decided to use intronic probes which showed a downregulation of the signal which parallels the slowing down of axis elongation. We now also provide a quantitative PCR analysis for these genes from microdissected tail buds in Fig 8C-E that confirms our ISH data. This new data confirms small progressive downregulation of T with a significant drop at the 25 somite stage when the first Hox13 genes are activated. […] Overall, this paper presents a striking phenomenon in the regulation of cell ingression through the primitive streak by posterior Hox genes and some very interesting data that explain to some extent the molecular mechanisms at play here. The authors still need to place the work in an appropriate context both in terms of the literature and the significance of this mechanism during body axis elongation; it may be that collinear activation of posterior Hox genes regulates tailbud morphogenesis half way through axis elongation, but does not directly regulate PSM length. We have deleted the sentence referring to RhoA in the Abstract. We agree that the formulation was unclear and we have changed the last sentence of the Abstract into: “Due to the continuation of somite formation, this mechanism leads to the progressive reduction of PSM size. This ultimately brings the retinoic acid (RA)-producing segmented region in close vicinity to the tail bud, potentially accounting for the termination of segmentation and axis elongation”. We now expand on these notions in the Introduction and Discussion as discussed in point 3 below. We have added these findings and discuss them more extensively in the Introduction. The following text has been added to the same part of the text:. We agree and have modified the text accordingly. 5) It would be informative to explain in the paper that the 25 somite stage is ∼when the tailbud forms and that this is when when cell ingression through the primitive streak ceases—refer to work from Susan Mackem's lab in chick showing cessation at HH stage16 (∼ 24-28 somites, Knezevic et al, 1998, and see Catala et al, 1995, and also Wilson and Beddington, 1996, in the mouse). It seems likely that the mechanism identified by the authors is most functionally significant at this mid-way stage; from then on the PSM is added to from an “internalized” set of precursor cells. McGrew et al 2009 and Olivera-Martinez et al, 2012 identify these cell populations by lineage analysis in the chick tail bud as the NMps (Sox/bra expressing cells) and also a transit amplifying cell population of mesodermal progenitors. I think the authors should explain this in the Discussion (and in the Introduction). As the paper currently reads it might be thought that ingression through the primitive streak continues until the end of axis elongation, when in fact in both chick and mouse embryos this ceases at somite 30 of ∼50-53 (chick, HH16) and 33 of 65 (mouse, E10.5). The cessation of ingression thus fits more closely with the establishment of the tailbud about half way through body axis elongation. As Hoxb and d13 begin to be expressed just after tailbud formation, they may contribute to conclusion of the ingression process, but this early role also leaves room for other actions for such Hox genes, including the regulation of cell proliferation in the tailbud mesoderm, described by Economides et al 2003. I think these considerations are important to clarify that the regulation of ingression that they uncover is distinct from the model they originally proposed in which this was directly linked to “exhaustion” of PSM precursors and elongation arrest. Our model argues that posterior Hox genes regulate axis elongation by controlling cell ingression in the PSM (and also by regulating cell motility, independently of ingression) and thus makes the implicit assumption that this ingression process continues during axis elongation. Whether this is the case or not as raised by this comment is an excellent point. However, we do not agree with the assertion that in the chicken embryo, cell ingression ceases at stage 16HH (25-somite stage). While this has been published in the Knezevic paper in 98, since then Ohta et al (Gen Yamada’s lab) have published in 2007 in Development that ingression continues at the level of the Ventral Ectodermal Ridge (the remnant of the primitive streak which forms around the 25-somite stage) at least up to stage 20 HH (40-43 somites). More recent data from Kate Storey’s lab (Olivera-Martinez et al, PLOS Biol, 2012) also show ingression from the late chordo-neural hinge as late as stages 21-22HH (>45 somites). Overall, very little is known about the movement of cells in the tail-bud after the 25-somite stage in the chicken embryo. In mouse Wilson and Beddington (1996) initially reported an arrest of ingression when the posterior neuropore closes at the 30-somite stage, but subsequently Wilson and Cambray (2002) provided evidence for mesoderm ingression after neuropore closure. In addition, we also show that posterior Hox genes act on cell motility in the PSM, which by itself might be sufficient to explain some slowing down of elongation. We feel that there is already a very significant amount of data in the paper characterizing the properties of a set of Hox genes on axis elongation. While it will be interesting to perform structure function analysis, we feel this is beyond the scope of the paper. Moreover, Hox genes have been first cloned in the 80’s and to date, very little is still understood of their function as transcription factors. 8) Finally, the authors have attempted to determine whether Sox2 expression is present in epiblast cells that are delayed in their ingression through the primitive streak. Unfortunately, they have been unable to improve the in situ hybridization for Sox2 transcripts (even the control embryo does not reveal the normal caudal domain of Sox2 expression, which extends into the tailbud (e.g. see Uchikawa et al, 2011, Dev. Growth & Diff; Olivera-Martinez et al, 2012). The authors have also been unable to detect Sox2 protein using immunocytochemistry, and it is not clear whether this reflects a problem with antibody batches or another technical difficulty. The net result is that they do not provide any new data to address the possibility that cells fail to ingress because having reduced Wnt signalling and T expression they have lost mesodermal identity in favor of a neural fate. Given that they are unable to reproduce the Sox2 expression pattern published by many other groups, they should be cautious in the interpretation of their lower power in situ data, which leaves open the possibility that accumulating non-ingressing primitive streak epiblast cells continue to express Sox2. If the cells overexpressing posterior Hox genes were retained in the epiblast because of a switch to a neural identity, then one would expect to see the descendents of these cells in the neural tube. This is absolutely not the case as the overexpressing cells massively enter the PSM. Together with our low magnification Sox2 in situs that do not show upregulation of Sox2 in overexpressing cells, we believe that this strongly argue against Hox genes maintaining cells in the epiblast by converting them to a neural fate. Furthermore as shown on the movies, we clearly see ingression of Hox expressing cells in the PSM. The authors thank V Wilson, D Wellik, L Selleri, and members of the Pourquié laboratory for comments. The authors acknowledge P François, P Moncuquet, C Ebel, and O Tassy for help. This research was supported by the Howard Hughes Medical Institute, the Stowers Institute for Medical Research, a NIH grant R02 HD043158 and a Chaire d'excellence of the Agence Nationale pour la Recherche (ANR) as well as the European Research Council. © 2015, Denans et al.